I keep waiting for things to ‘slow down’ but each update seems to contain more and more information, as more and more schools and individuals become involved. 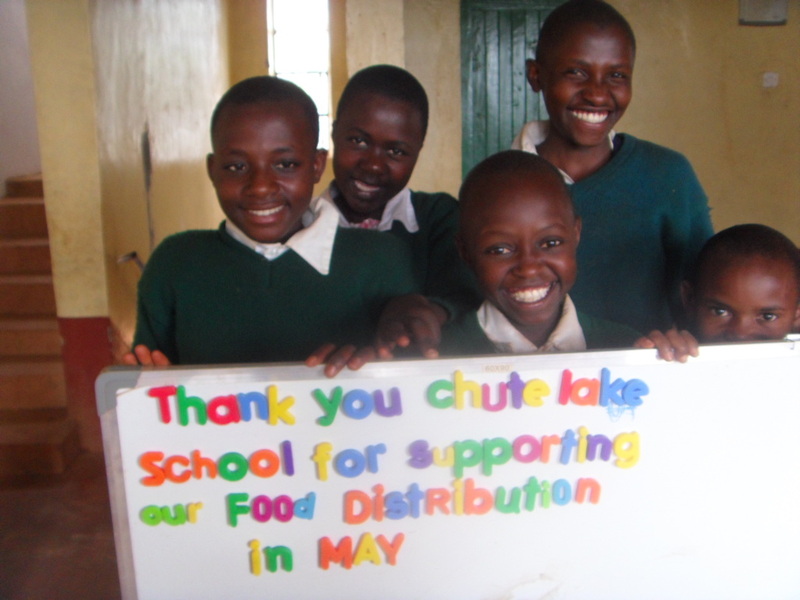 It was an active summer with food distributions, the completion and dedication of a new water project and trips to Kenya from sponsors. 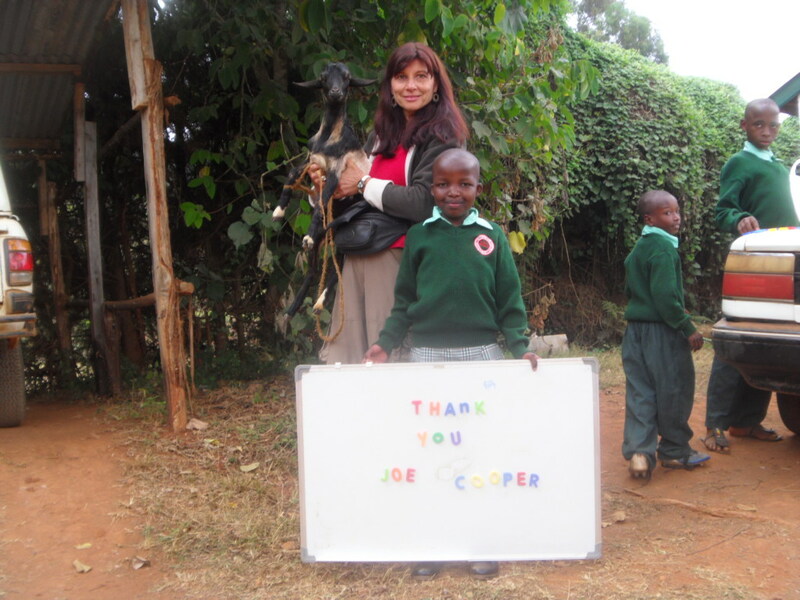 As always all trips and all expenses when in Kenya, are paid for directly from visitors. 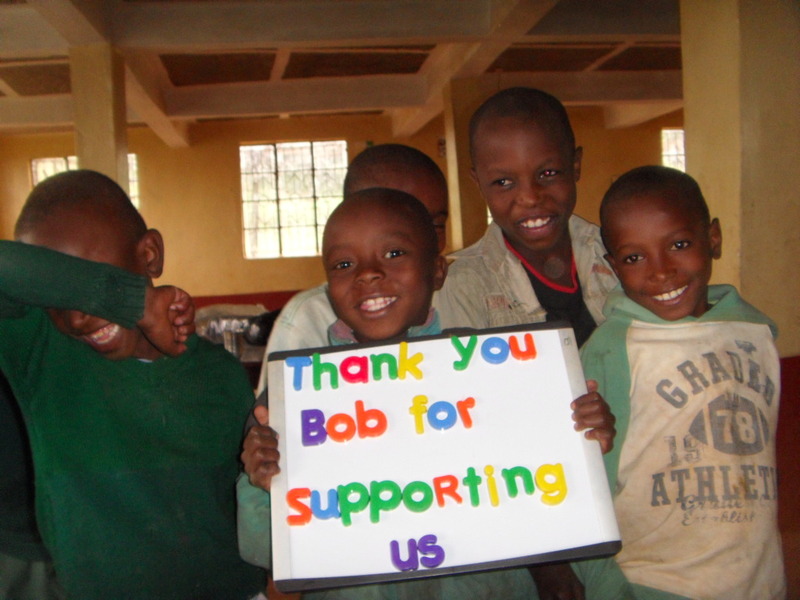 Never will any money from donations go toward any expense that isn’t completely directed – 100% – toward the orphans and projects of the Mbooni District. 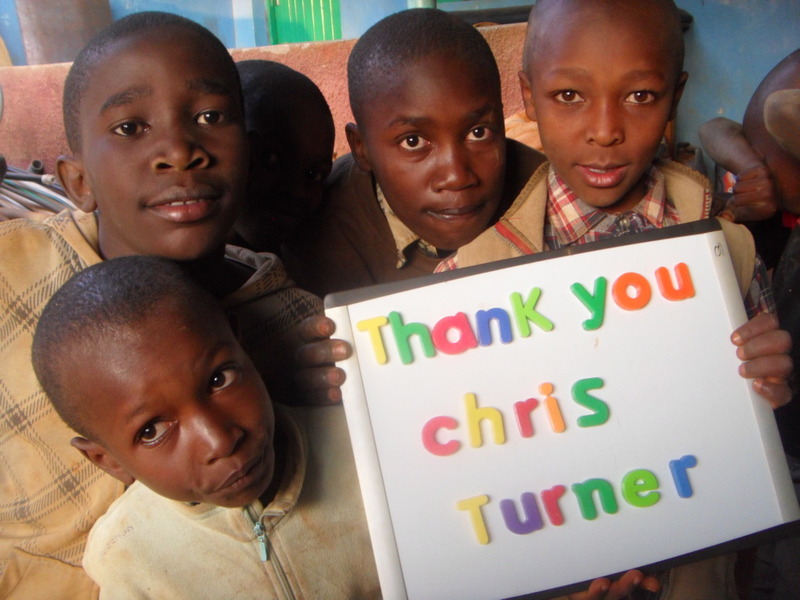 Many of the donations are acknowledged throughout the update. 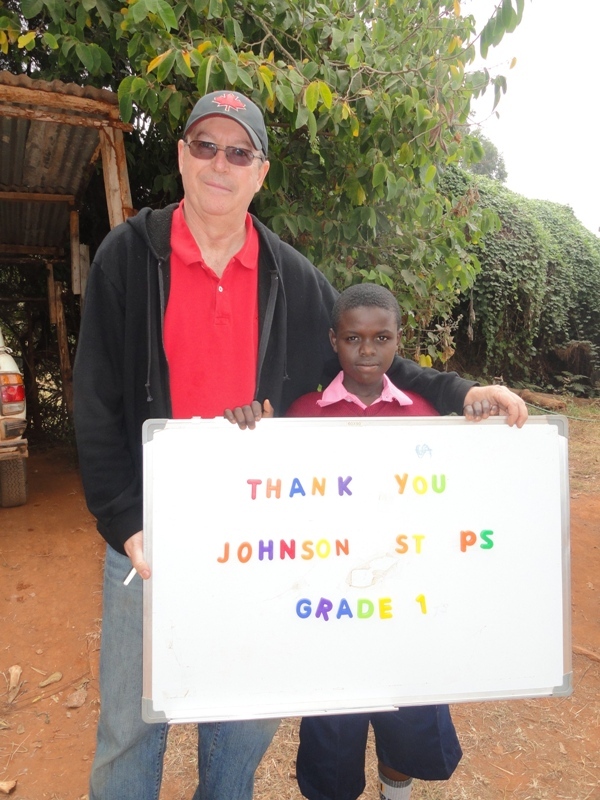 You will find thank you signs to give credit to the specific donations. 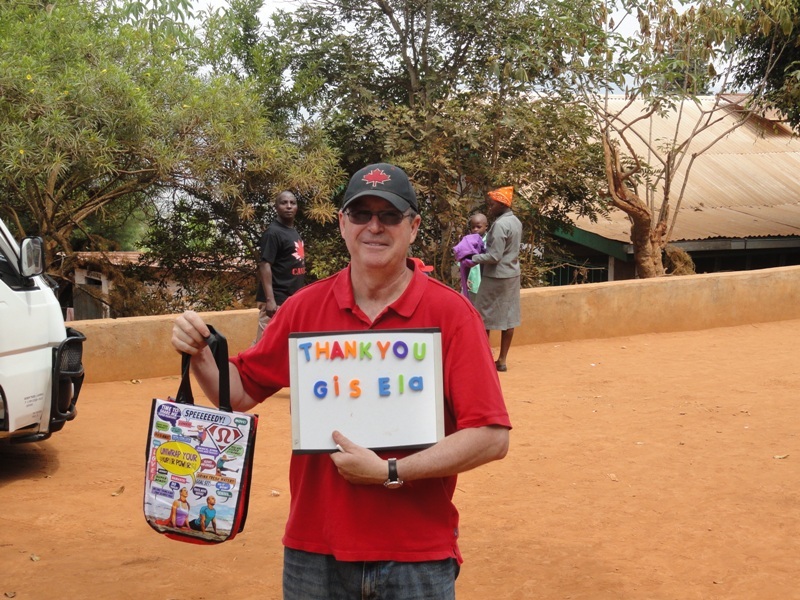 “After your visit, the Grade 5’s at Associated Hebrew School were so inspired by your talk that we decided to adopt your orphanage in Kenya as our charity for the year. 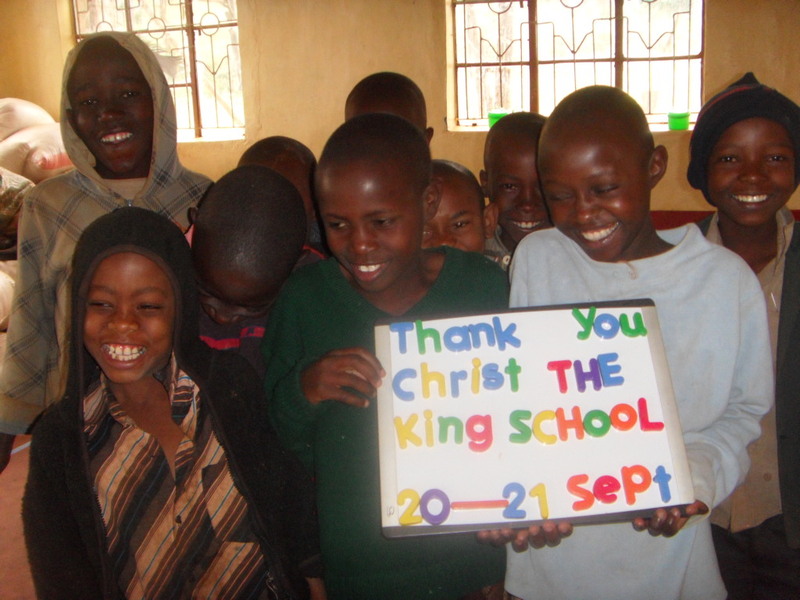 Our school theme this year was “What a Wonderful World”, and having a charity in Kenya fitted right in. 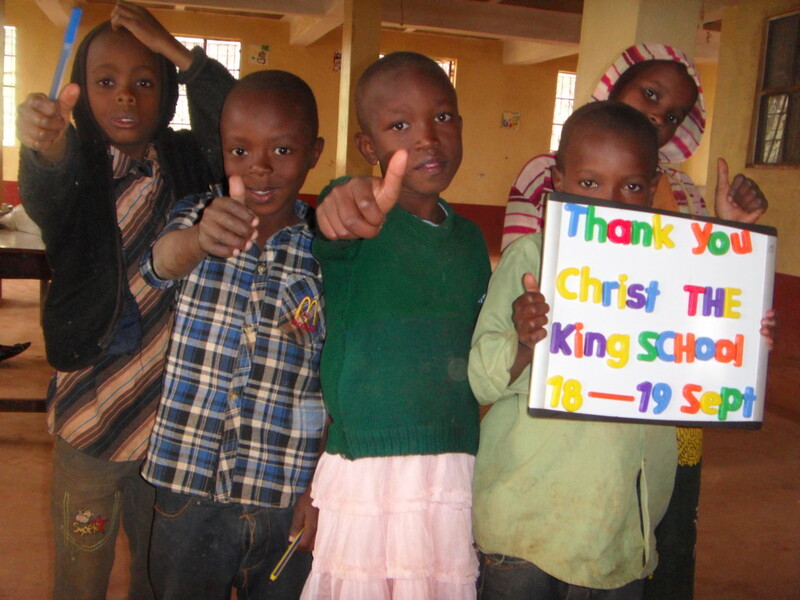 For one of our holidays, the students each brought in a toonie specifically for the orphanage, but we felt it wasn’t enough. 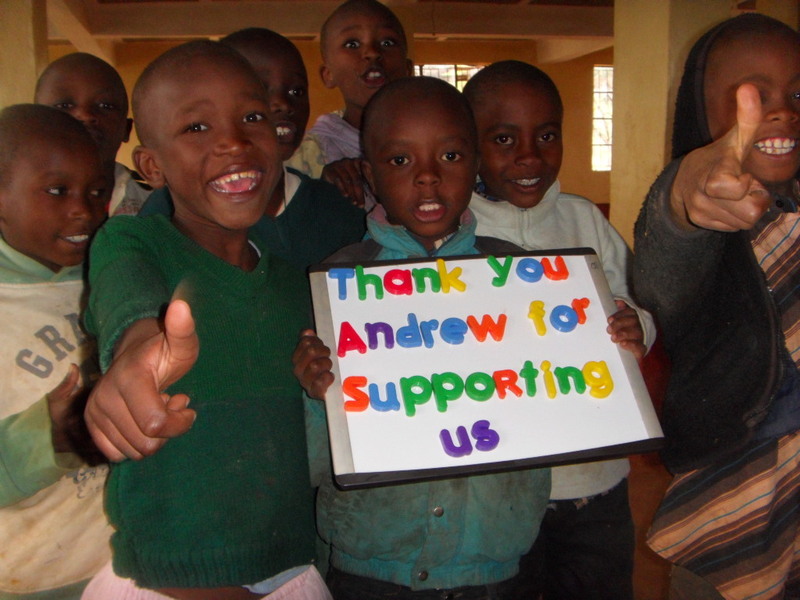 So, in order to swell our coffers, we held a “Tuckshop Day” and raised $1300! 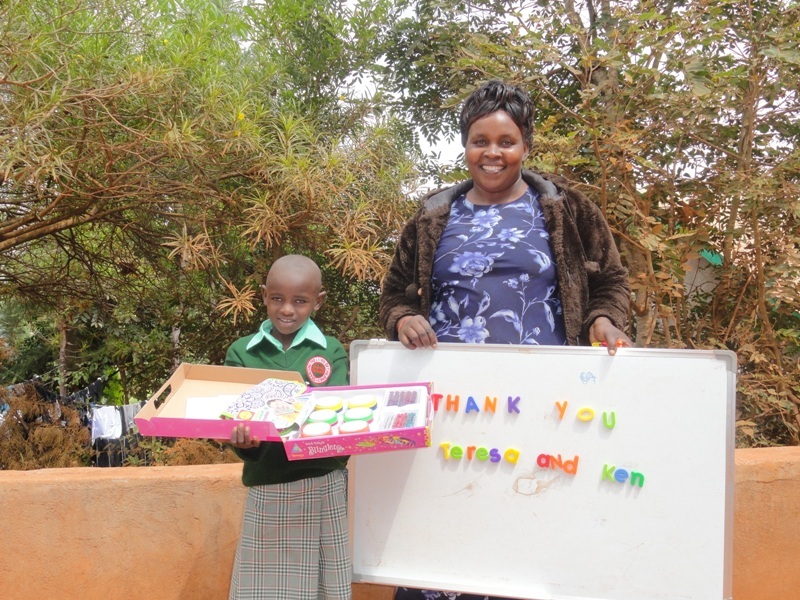 We hope that you will be able to use this money towards a birthday party at the orphanage, and this really touched our hearts. 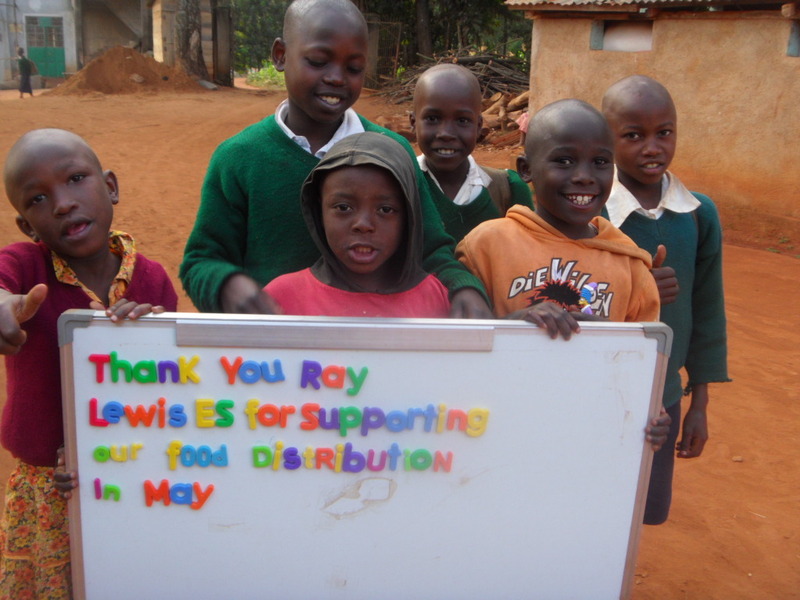 Thank you for showing us that we can all make a difference. 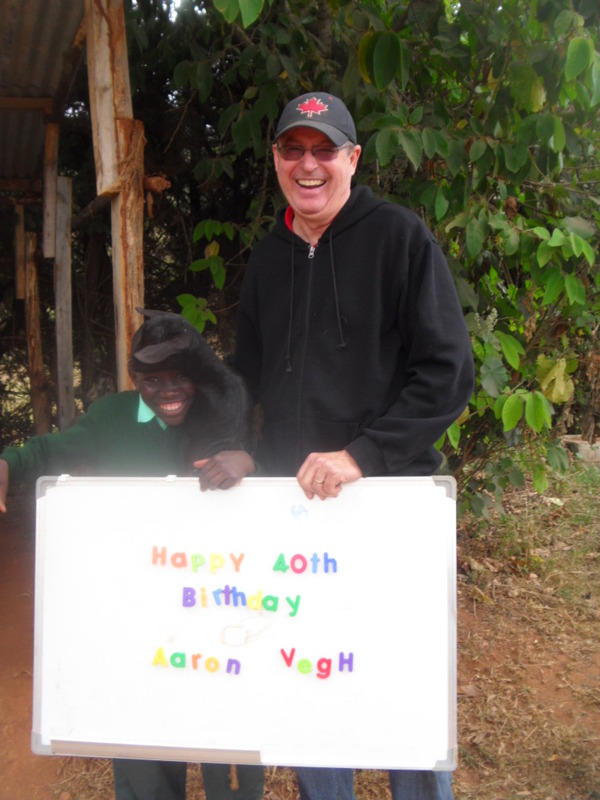 A birthday party has become a yearly tradition at Hope. 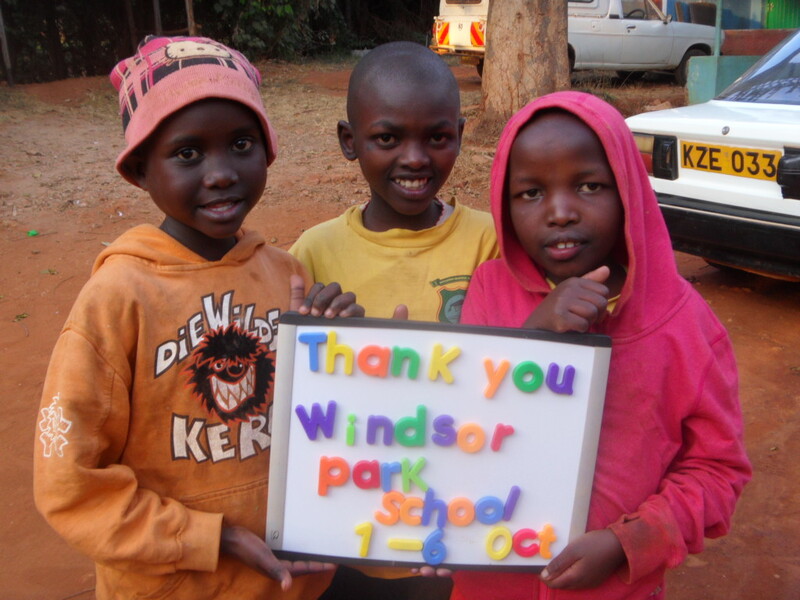 This year, thanks to our friends at Associated Hebrew School, 150 children had a birthday party! 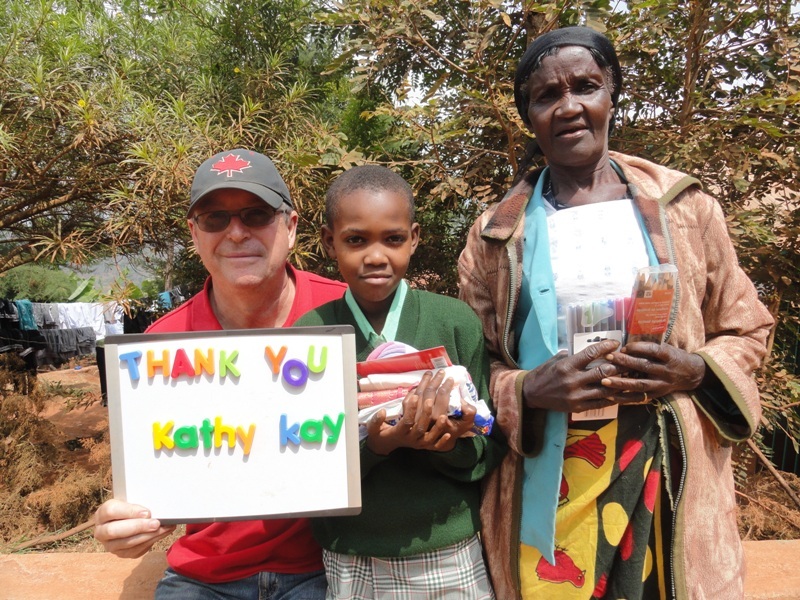 There was a meal, cake for all -including another 200 grandparents and guardians present for the food distribution day- and a loot bag filled with goodies which included pencils, pens, note pads, a toy, treats, and assorted other little goodies. This party originated when we realized that many of our children did not know their birthdays and did not have birth certificates. Now all of our children are in the process of being officially registered and as such must be given ongoing services by the government throughout their lives. This spring, the Alexander Graham Bell P.S. Creation of Hope Committee ran a snack bar at lunch and during Intermediate dances, offering healthy snack choices. 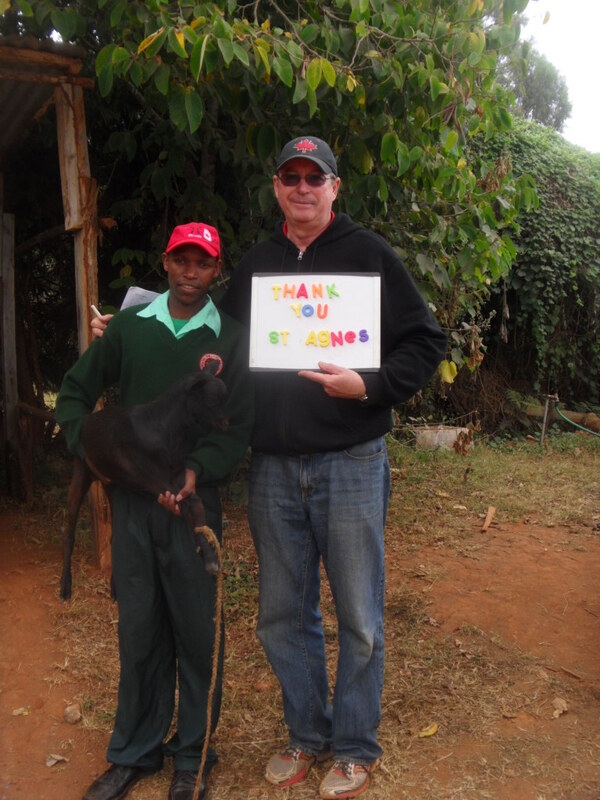 With the help of the A. G. B. student population, they successfully helped raise $1504.75 for The Creation of Hope. 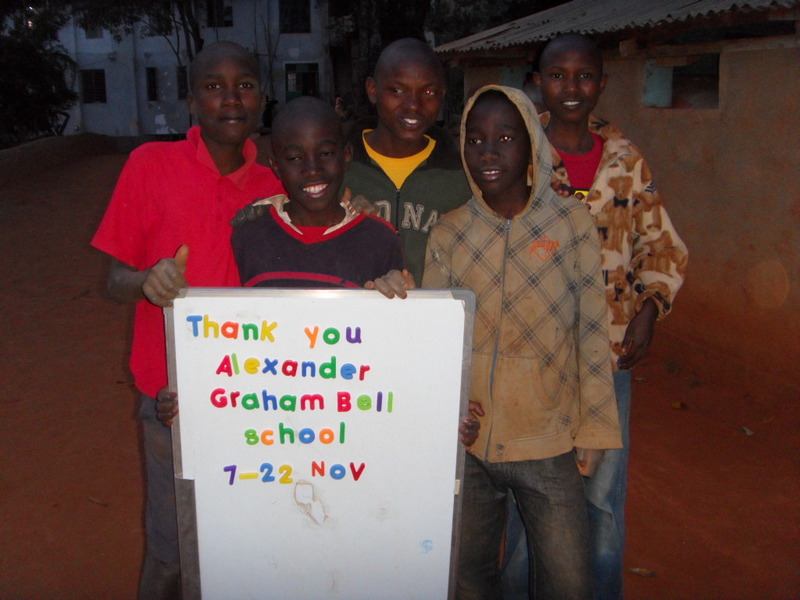 The money from Alexander Graham Bell is being used to support the residence for 16 days and the rest toward helping to finish construction on the building. 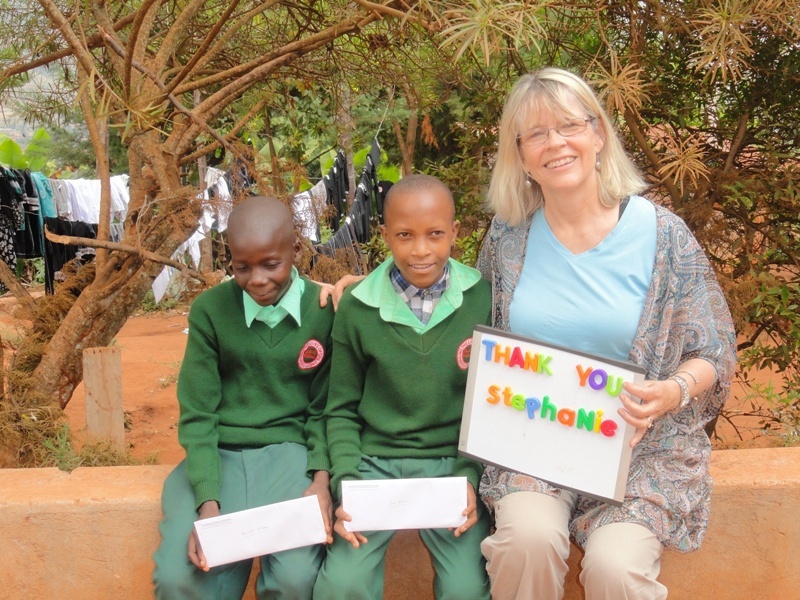 Fairview P.S., under the guidance of Lorraine and Lorin, has again raised a generous sum; this time, $1662.32! 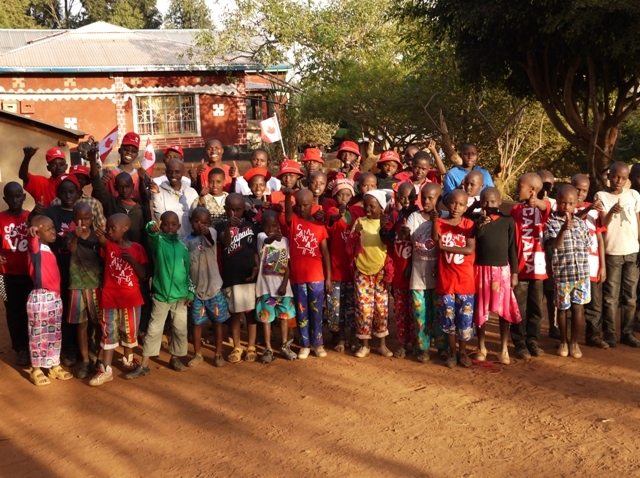 This money has already been directed toward putting in windows on the third and fourth floors, to help finish construction and for the children receiving new clothing as part of our Canada Day Celebrations. 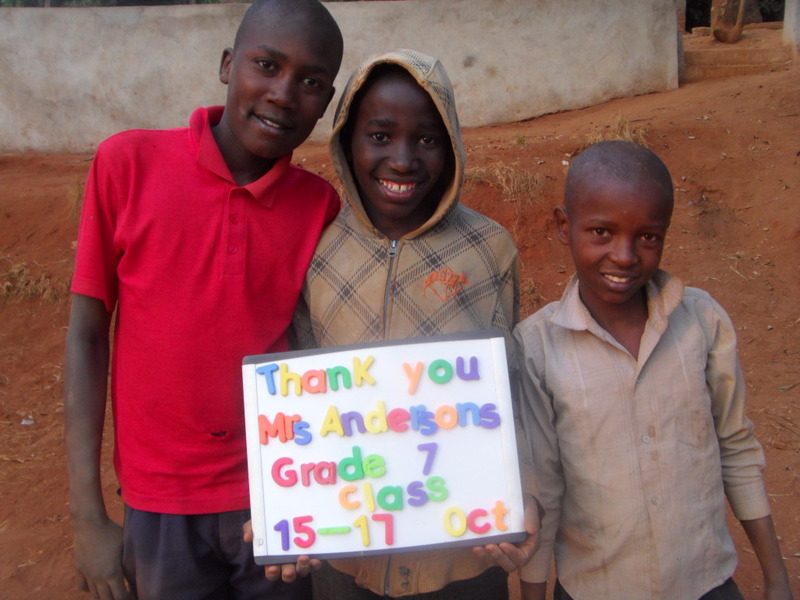 Mrs. Anderson’s Grade 7 class at St. Bridget C.S. in Brooklin raised $165.00. 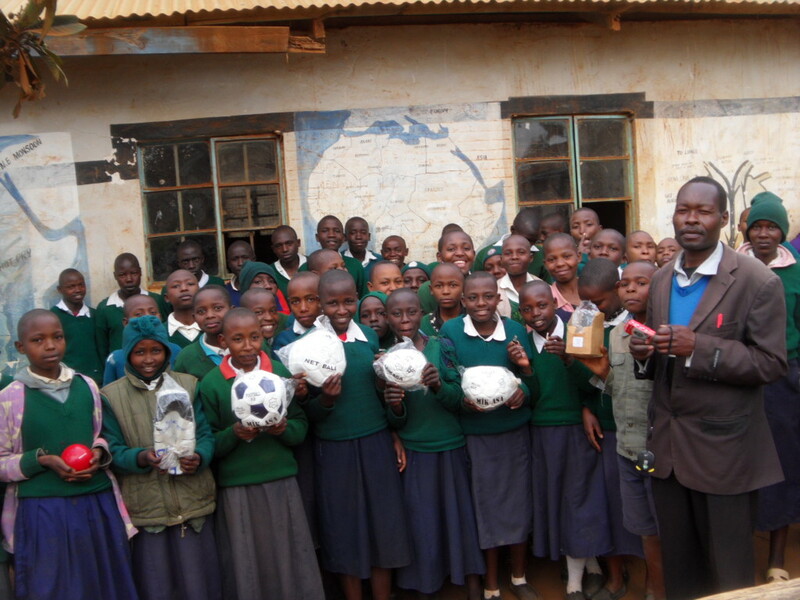 St. Christopher C.S. in Oshawa donated $471.00. 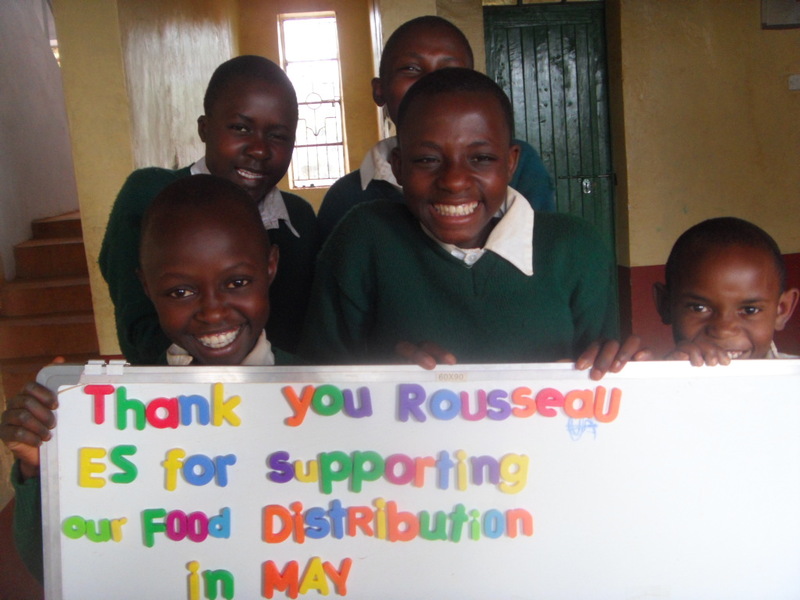 This money was used to subsidize the food distribution in August, support three specific days for the entire residence. Cindy Kirkpatrick and her students at Johnson Street. P.S. have made an additional donation of $89.07. 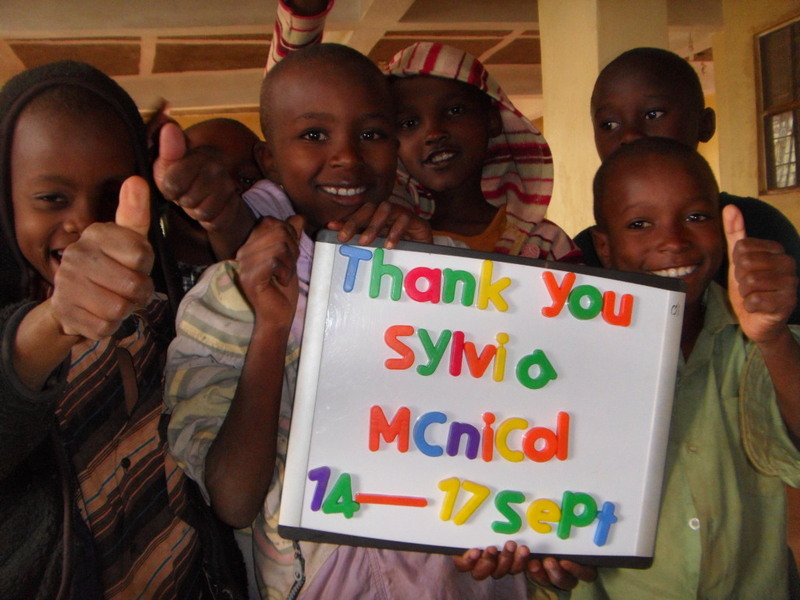 Their previous donations are acknowledged in the thank you signs listed below. 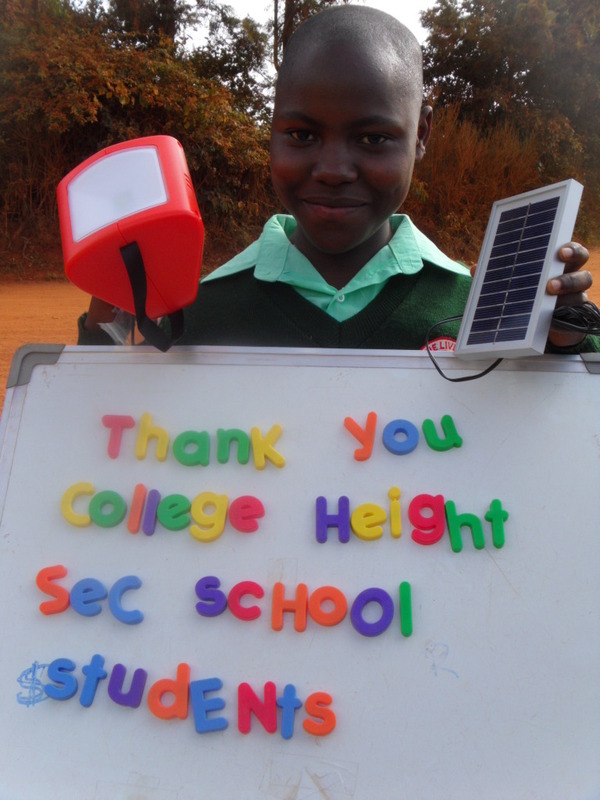 This money was used to purchase two solar lights for the residence. 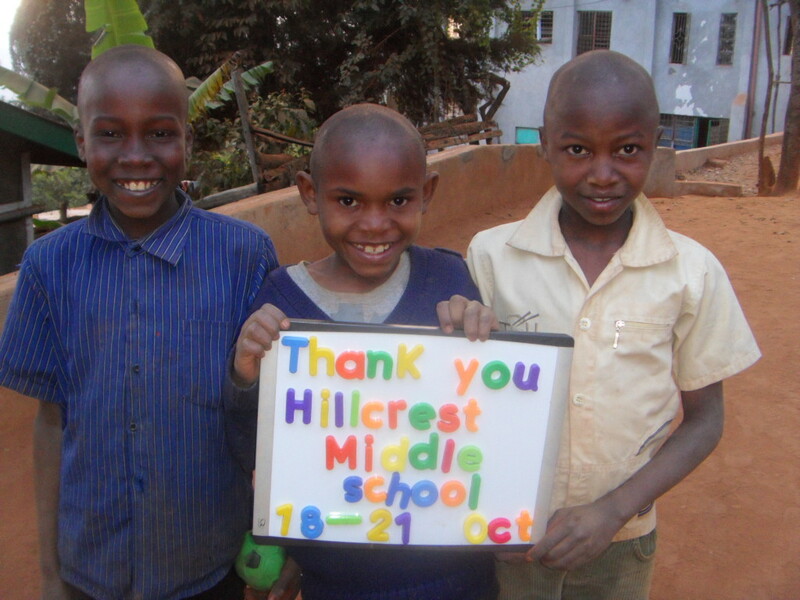 Hillcrest Middle School under the direction of Rose Ngo raised $375.45. This is being used to support the program for 4 days and the remaining money was directed for construction costs to help finish the building. 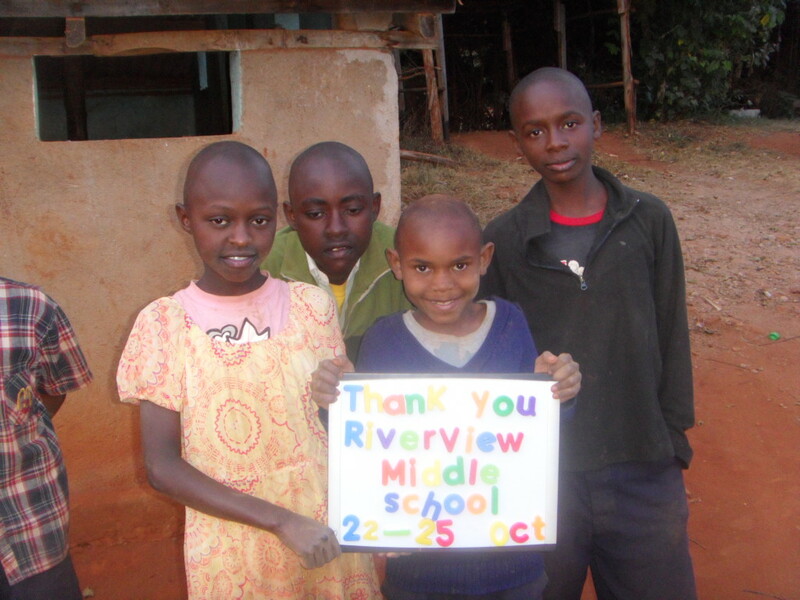 Riverview Middle School in New Brunswick, under the guidance of Jim Burkett, donated $365.00. This will support the program for 4 days and the remaining cost will be used for construction costs. 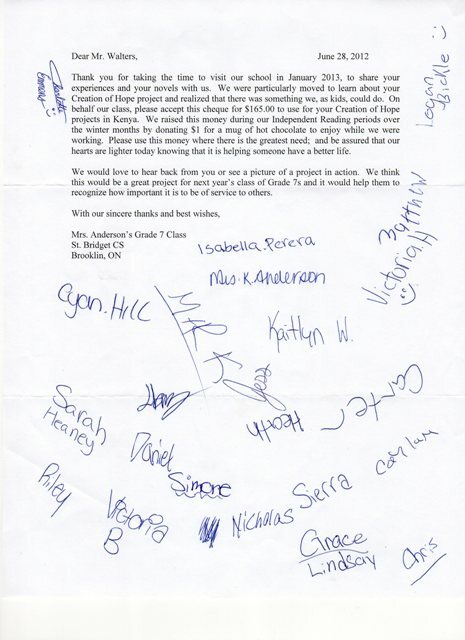 SFX Catholic High School in Gloucester raised $141.50 which will be directed to support three days of the program. 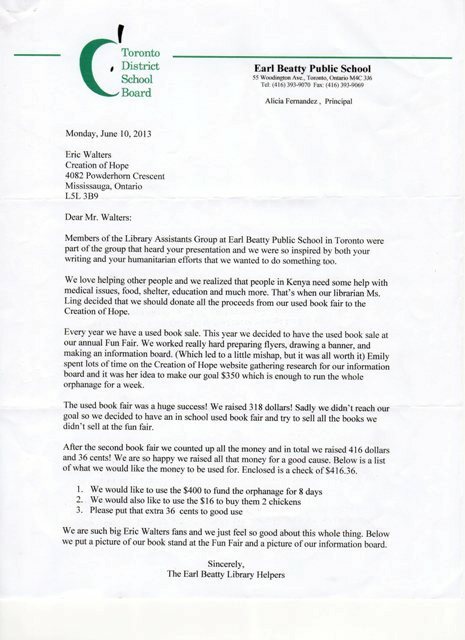 Stuart Scott Public School in Newmarket donated $75.00. 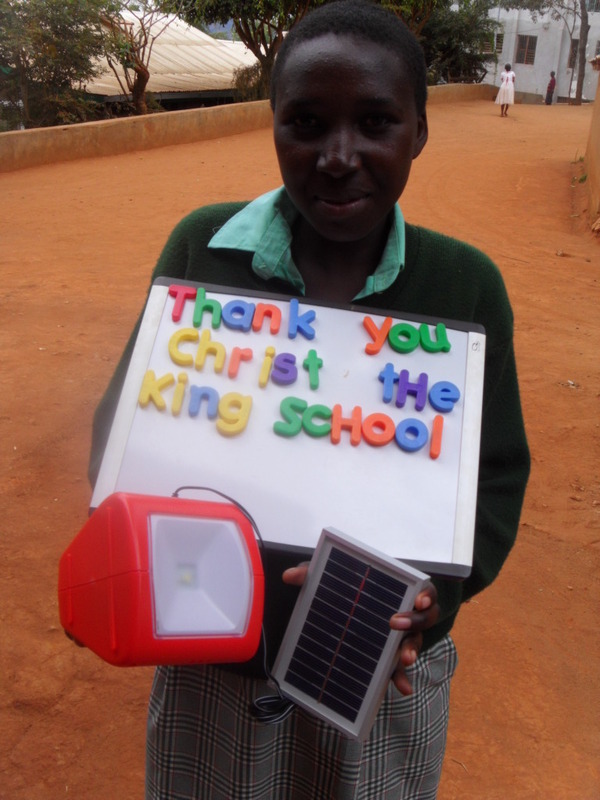 This money was used to purchase two solar lamps for children in the community. 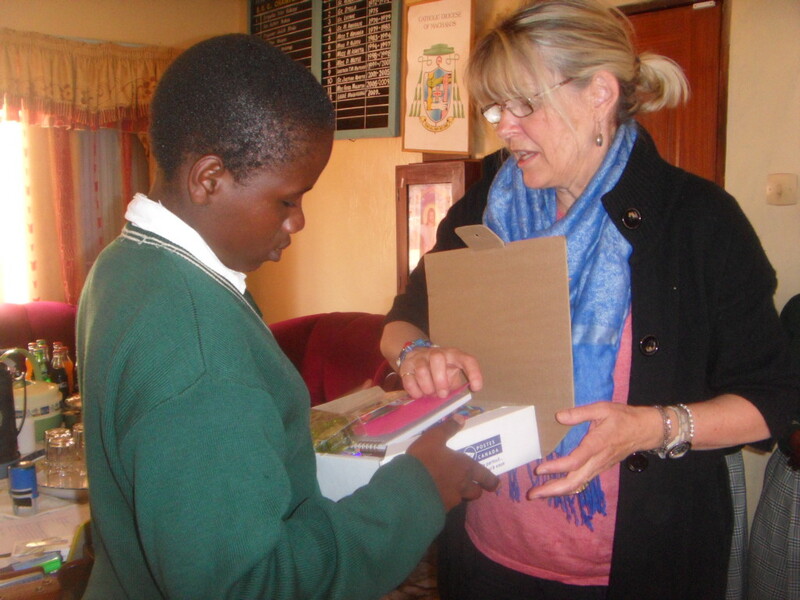 Glendale, in Brampton, under the direction of Melanie Noordhuis raised $543.00. This money has been used to help complete the construction of the building. 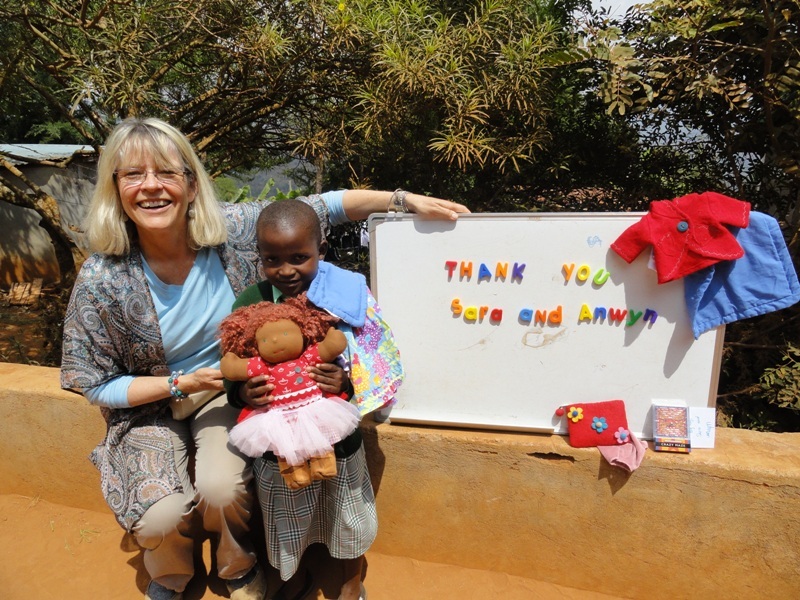 Melanie is an incredible supporter of the program and personally sponsors two children. 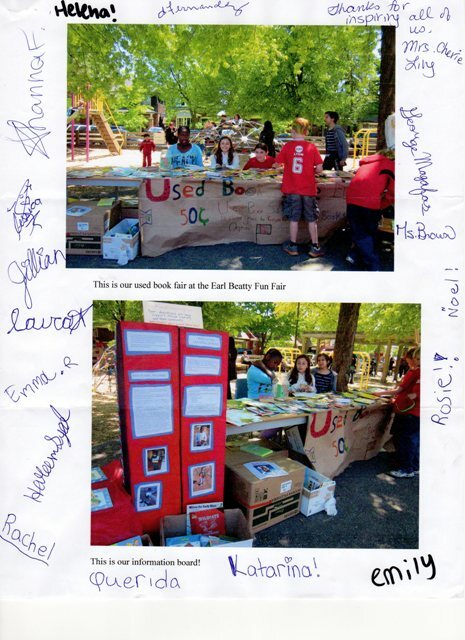 The students and community of LaSalle PS combined literacy, recycling and a love of “paying it forward” on Thursday June 6. From 8:30 am to 7:30 PM, students, friends and family shopped at the school’s Giant Used Book Sale to raise tuition money for Faith, Eric, and as many other Creation of Hope students as possible. At the end of the day, over $2100 was raised! 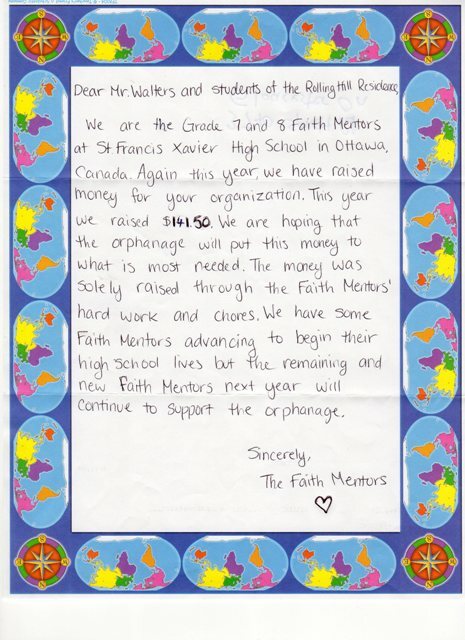 The funds from LaSalle are being placed in our high school tuition fund for the coming school year. 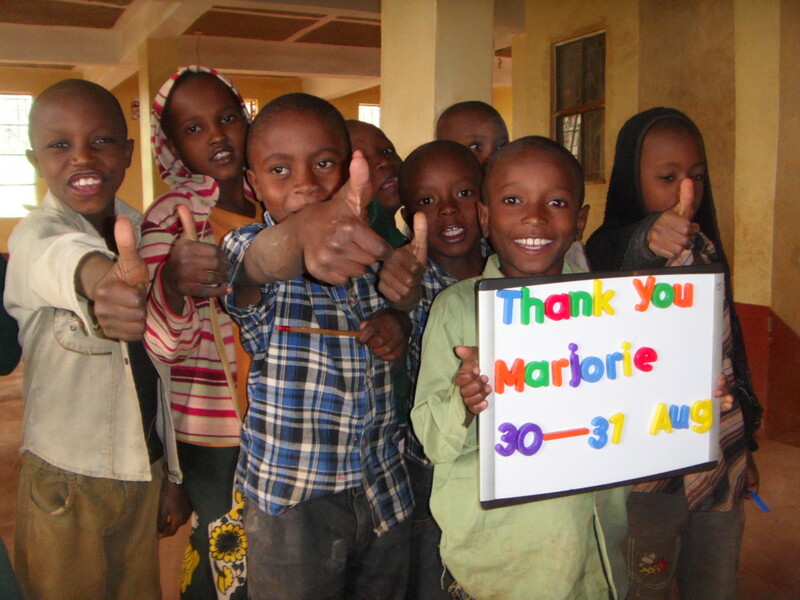 Special thanks to Martha Martin for being the driving force and caring heart behind this donation. 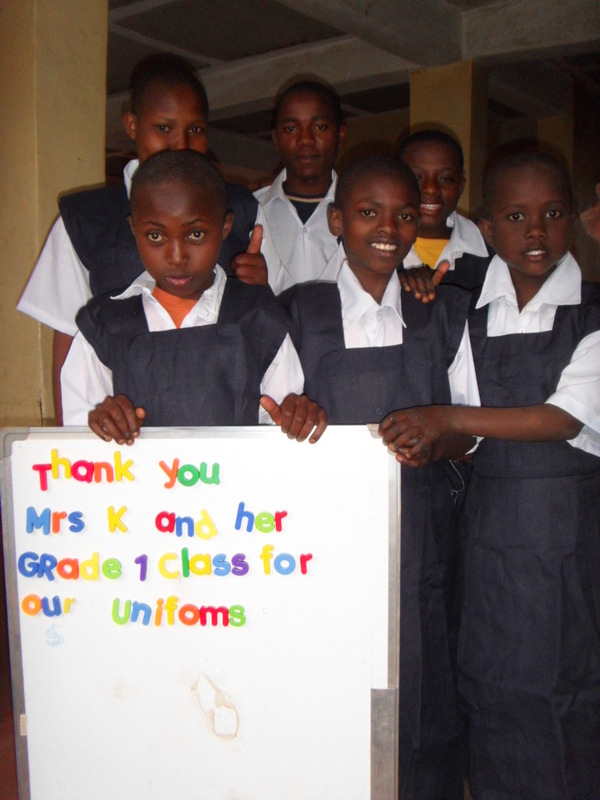 We will have an amazing 43 children in high school or post-secondary starting in January! 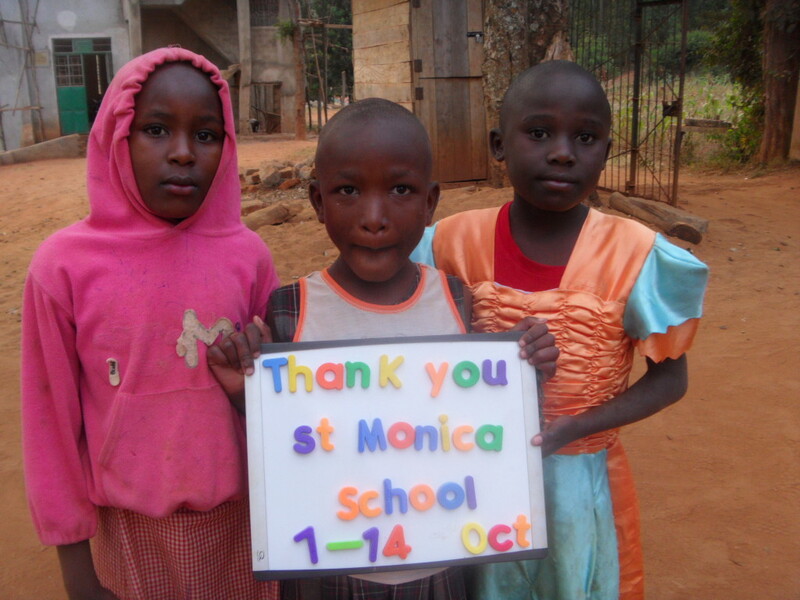 St. Monica C.E.S. in Markham raised $437.85. 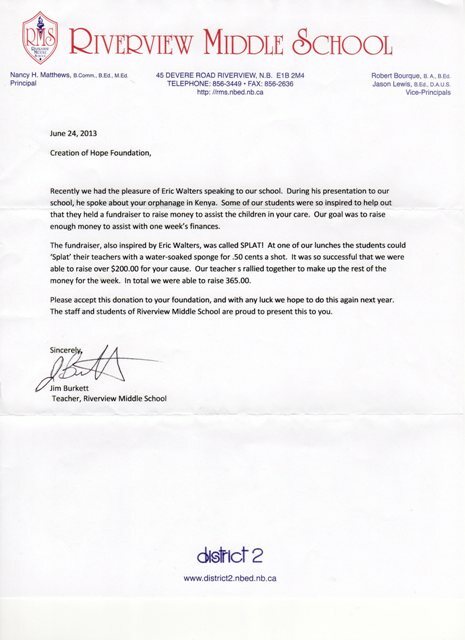 This money was directed toward ongoing support of the program and funded 8 days. The remaining $37.85 was used for the final stages of construction of the building. 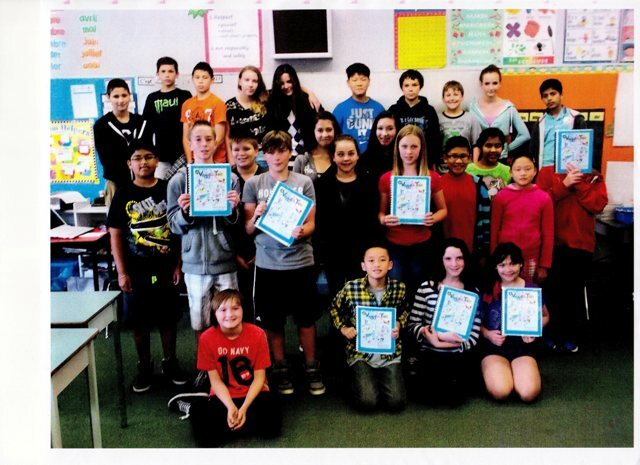 Alexander Middle School in Medicine Hat raised $225.12. This donation is being used to support the program for 4 days and the additional $25.00 for paint for the final touches on the new building. 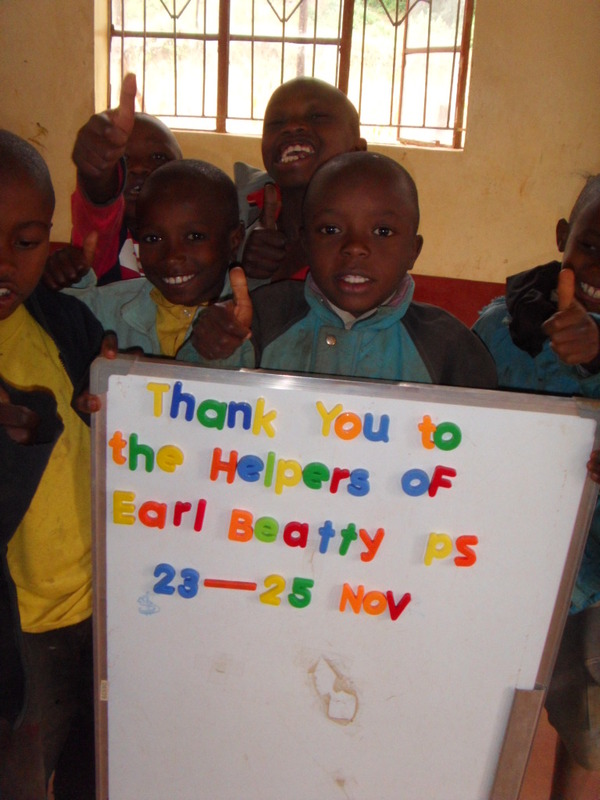 Earl Beatty P.S. 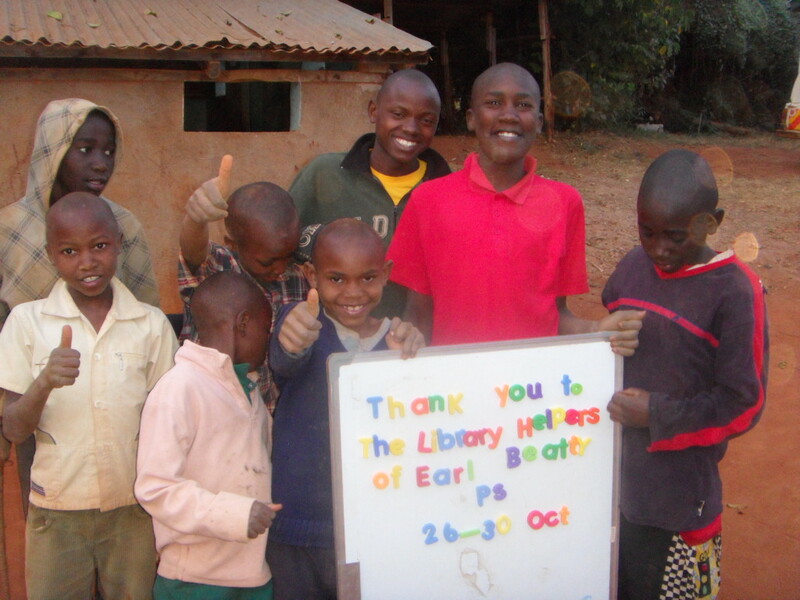 – the Library Helpers – under the direction of Ms. Ling raised $416.36. 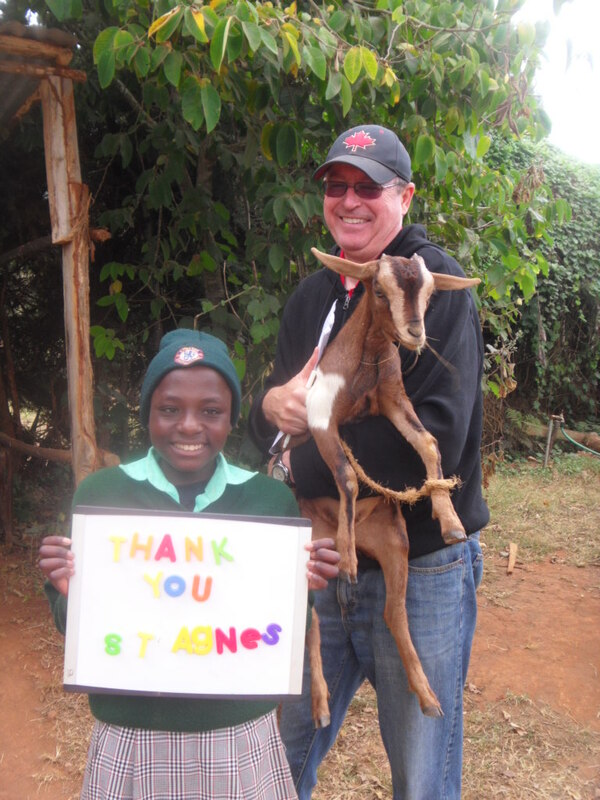 St Agnes C.E.S. 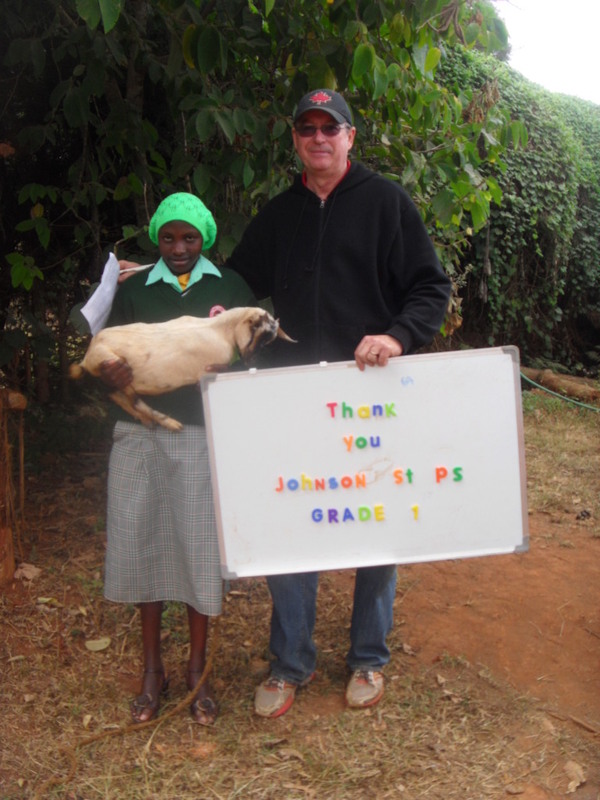 raised funds to purchase two goats. 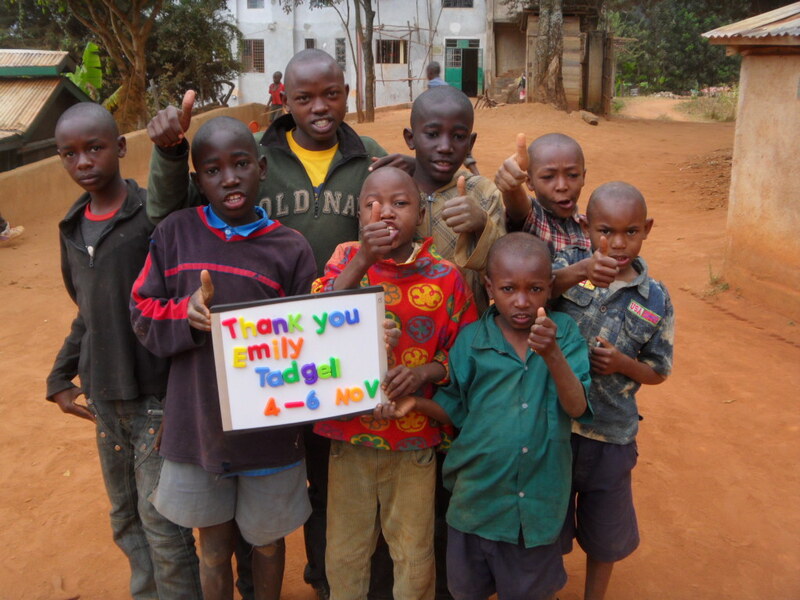 Emily Tadgell made a generous donation that will support the program for two days. Riley and Hayden held a garage sale and supported the program for two days! 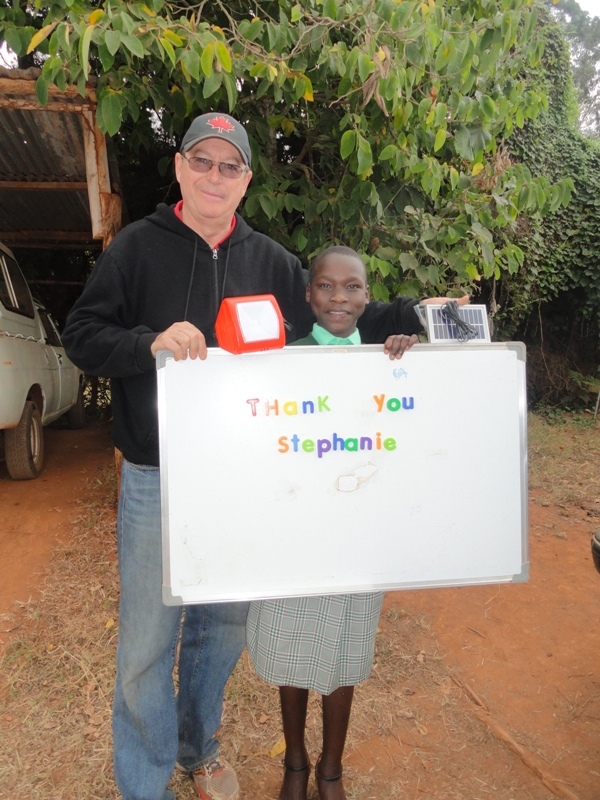 Steve Pitt has made another generous donation to the program. 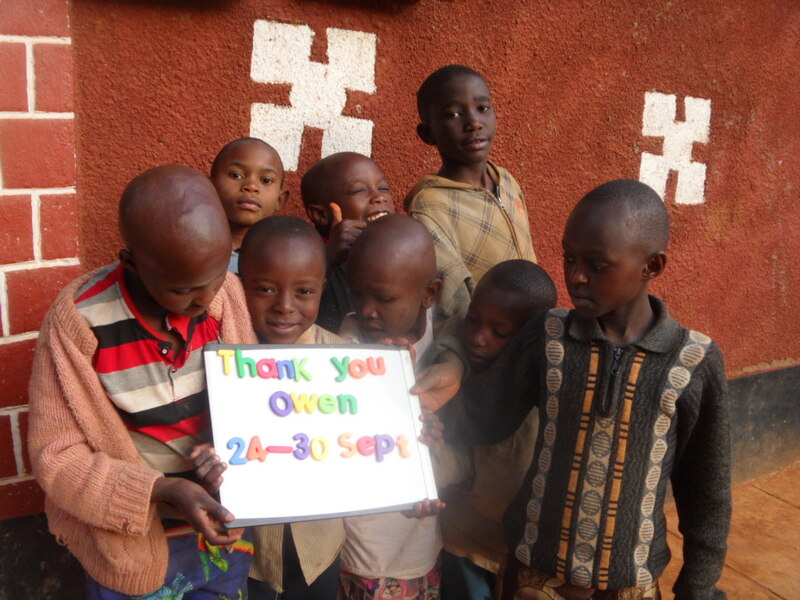 Owen, from Kelowna B.C. had his 8th birthday party. 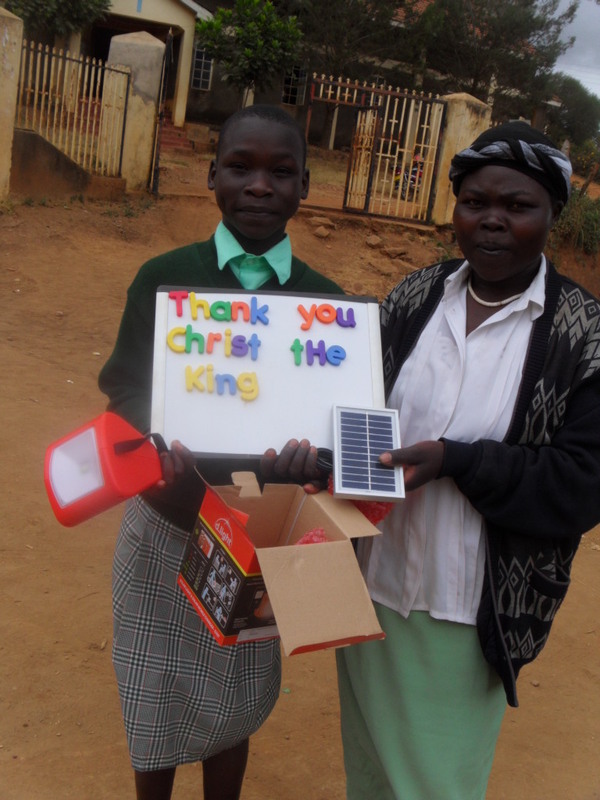 Instead of presents he asked that donations be made to The Creation of Hope. He raised $520.00! 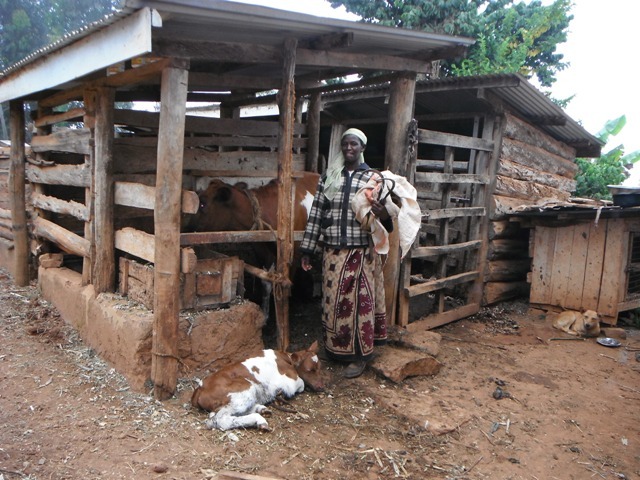 This is being used to support the program for 7 days and for ongoing costs to finish constructing the building. 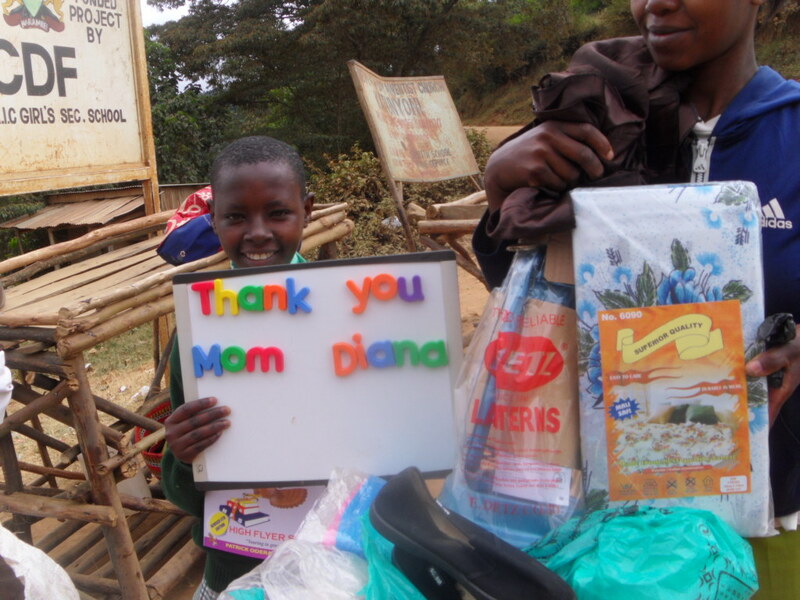 Kate made a donation to buy some sports equipment for ‘her’ school. Daily Support – Over the past year schools and individuals have been able to support the ongoing needs of Rolling Hills Residence for $50.00 per day. 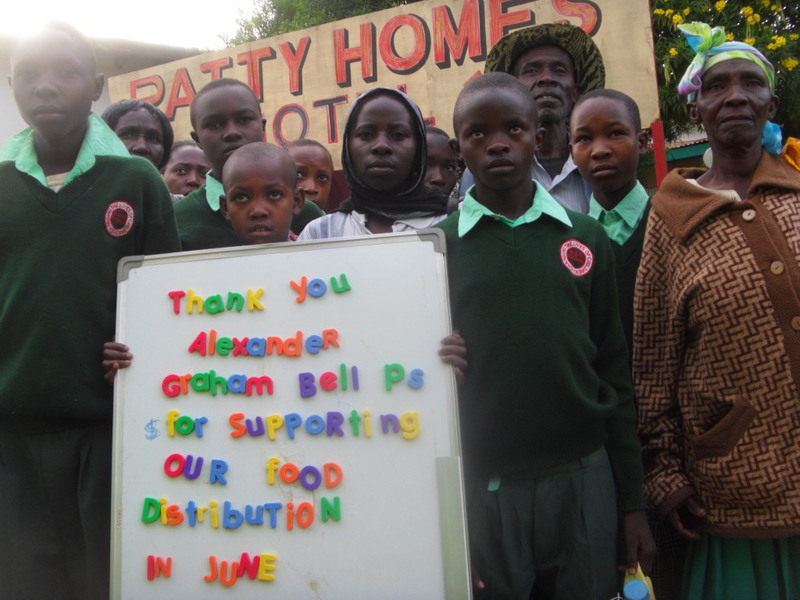 This provided the food for all of the children – (ranging from 44 children) – their routine medical care, basic school supplies, the salaries of the night watchman, matron and tutor, and the electricity, sanitation and water for the entire building. 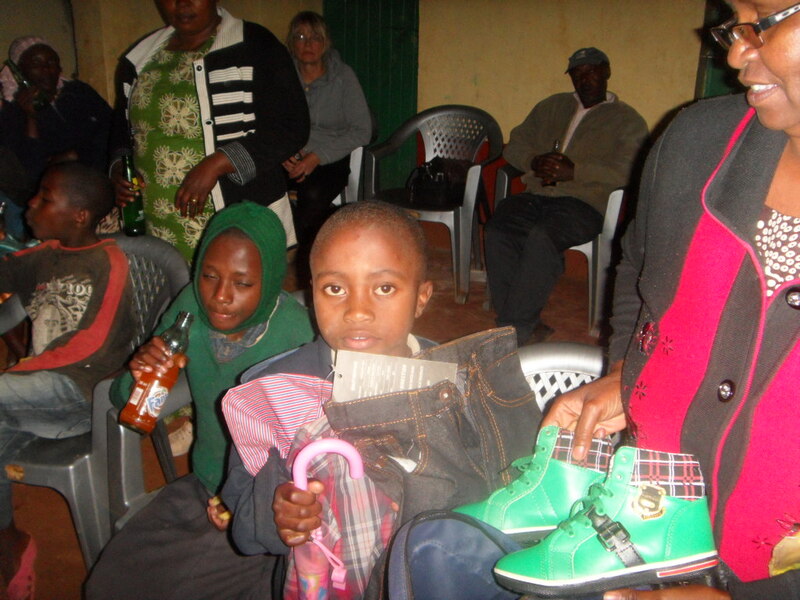 Every month we provide approximately 2.2 tons of food and supplies to the orphans in the community who reside with extended family members. 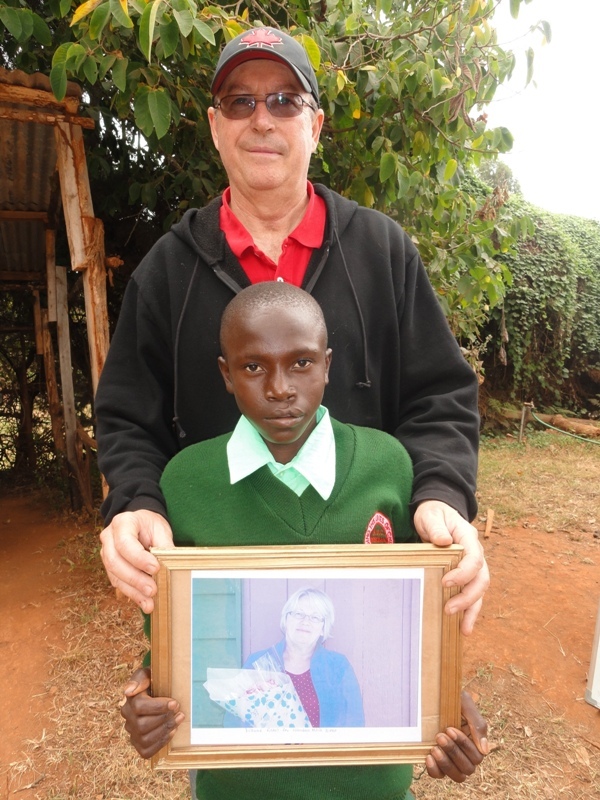 There is always a short-fall between money donated by sponsors and the money that this distribution costs – often in the neighborhood of $400 – $500. 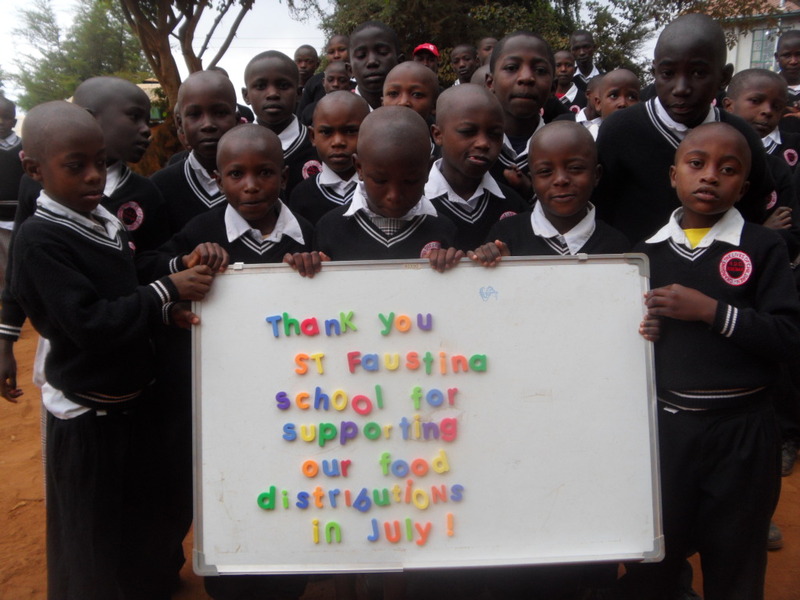 These schools have made donations that have helped to offset this shortfall. One of requests we get from our children is the means for them to work at night on their school work. 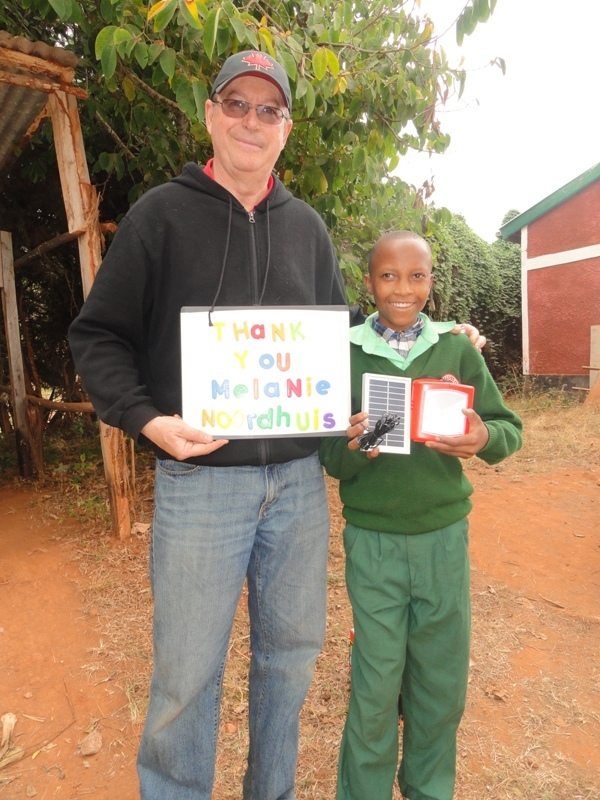 Being on the equator Kenya receives almost constantly 11 ½ hours of dark, 11 ½ hours of light and another hour of refracted light at dusk and dawn. Children leaving early for school, coming back late and then doing chores often find that darkness comes before they are able to start on their school work. 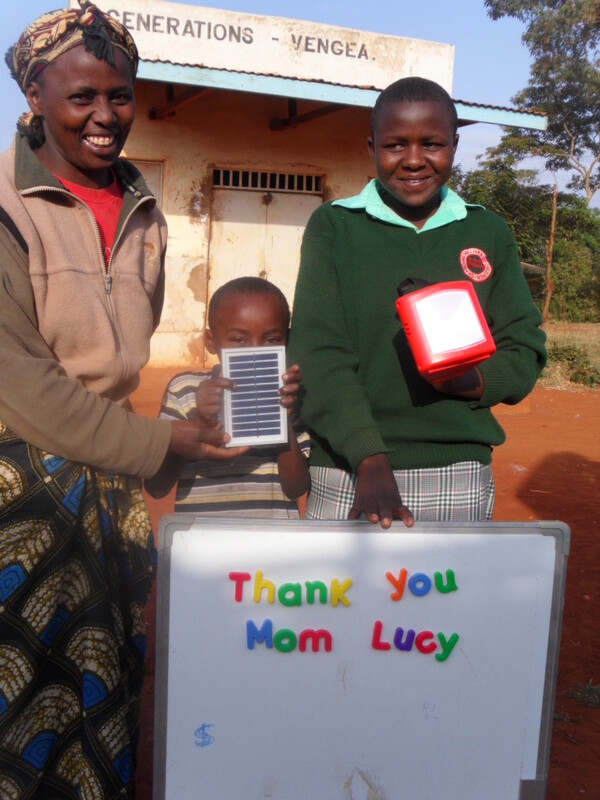 We have previously been providing lanterns and kerosene. This solution has some issues. We must constantly supply more kerosene, the fumes are rather toxic and unpleasant and the light somewhat ‘unnatural’. 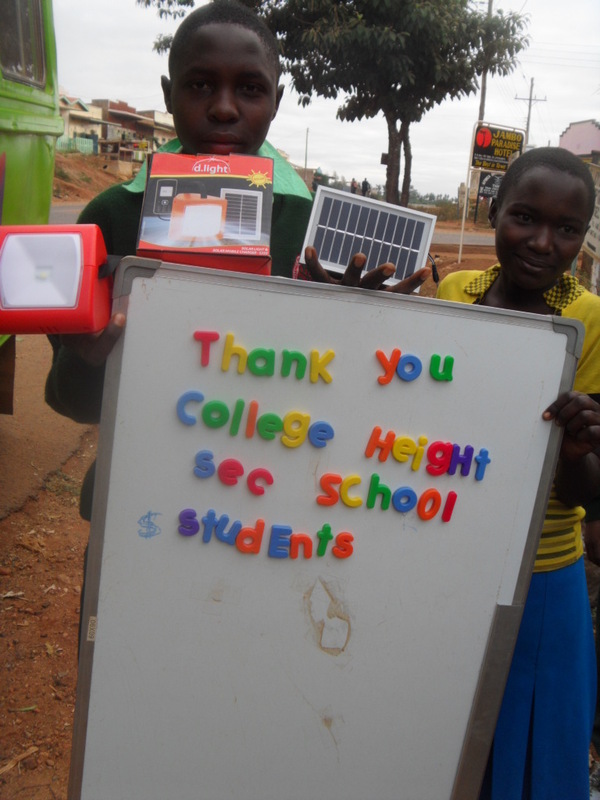 We have been experimenting with different types of solar lights and models have been selected for use. 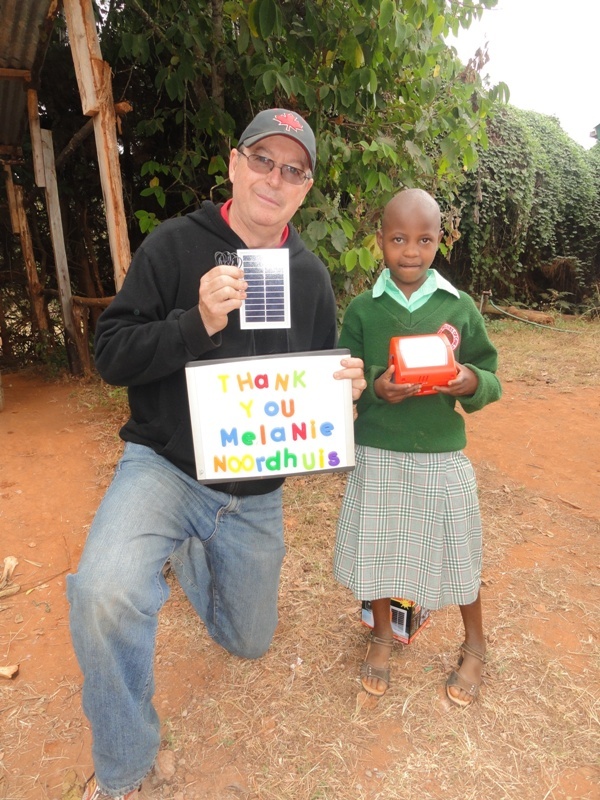 Aside from being able to provide light there is also a capacity for cell phones to be charged. At present people go to the local town and pay for cell phone recharging. Charging neighbours’ cell phones is a way for our grandparents to possibly earn some funds. 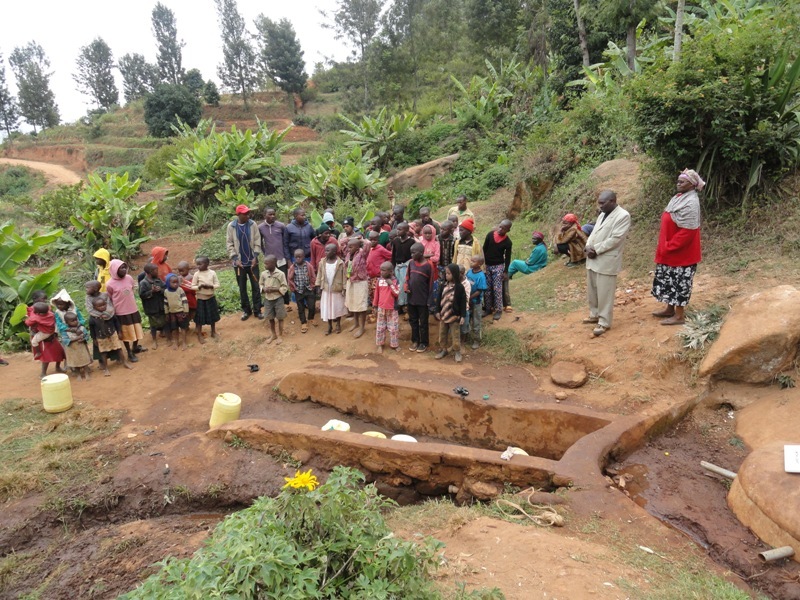 The people at the bottom of the valley – literally within sight of our residence – were drawing water from a small trickle coming out of the mud. It was the only water source for irrigation of crops, water for livestock, washing and drinking. 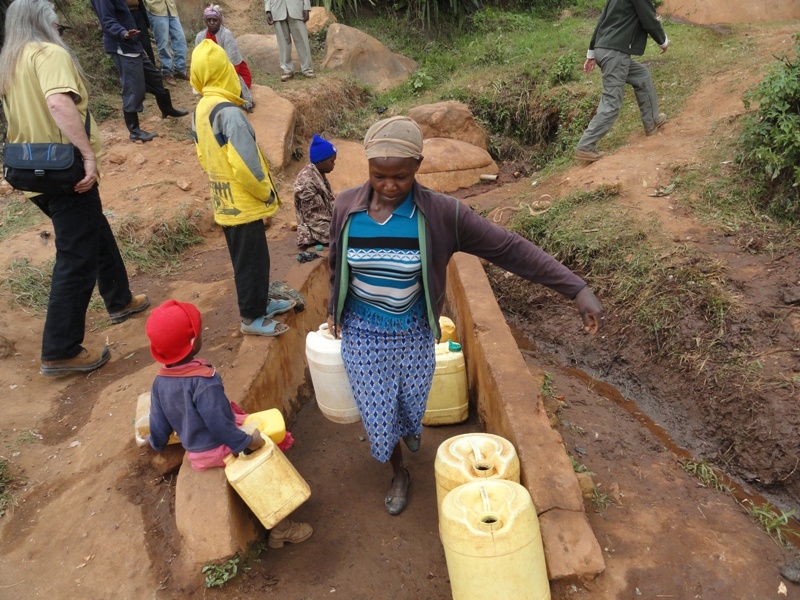 This water was contaminated and a constant source of water-borne diseases. We partnered with the community. 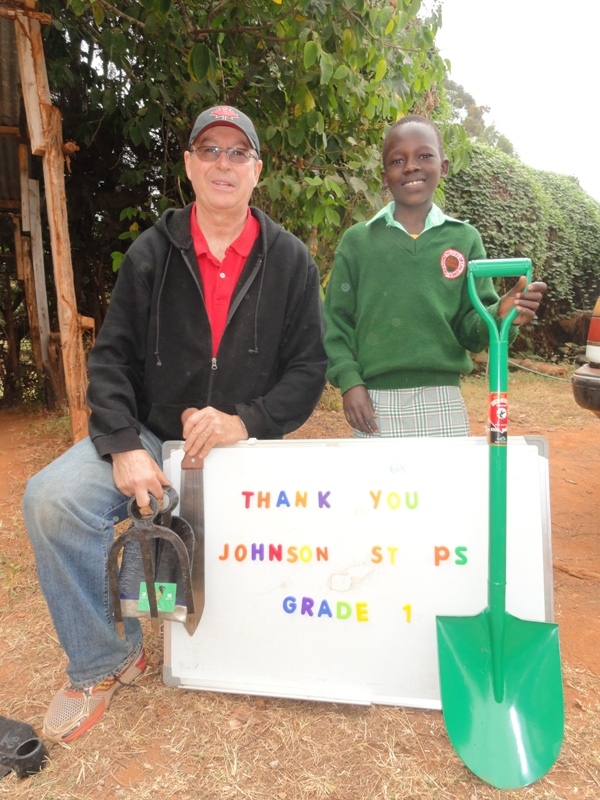 They provided sand, gravel and labor while we provided cement, iron rods, and funding for local expertise to design and coordinate construction. 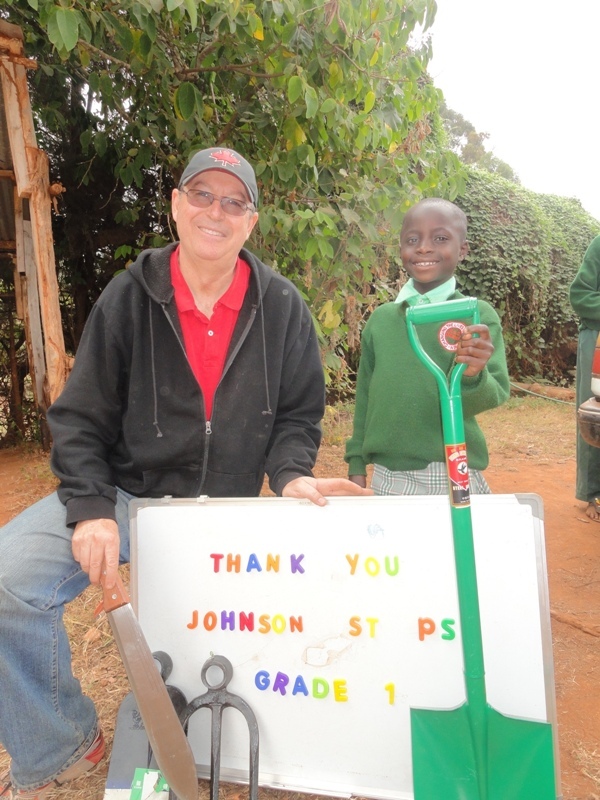 This was our third water project – plus the well at the residence. A committee of local people was formed to oversee all aspects of the planning, construction and maintenance of the project. 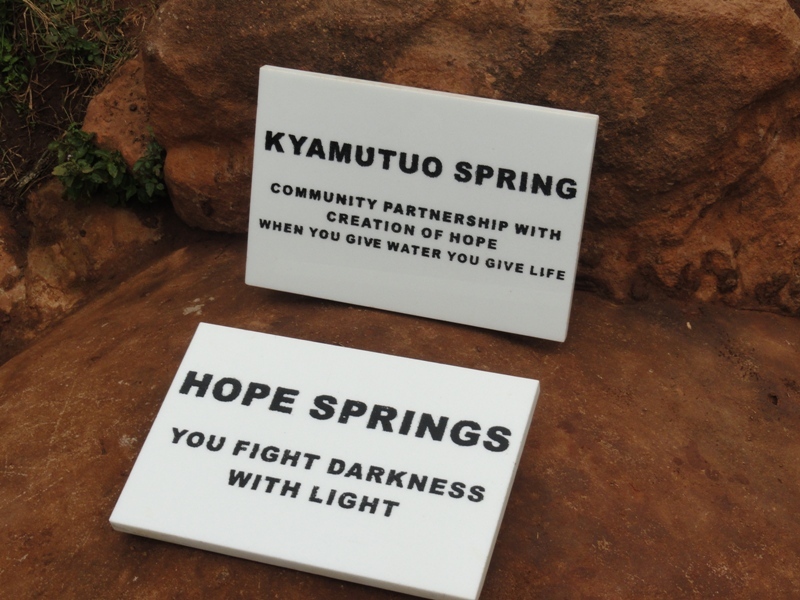 This is our third water project – along with the well at the residence. If you give water you give life. 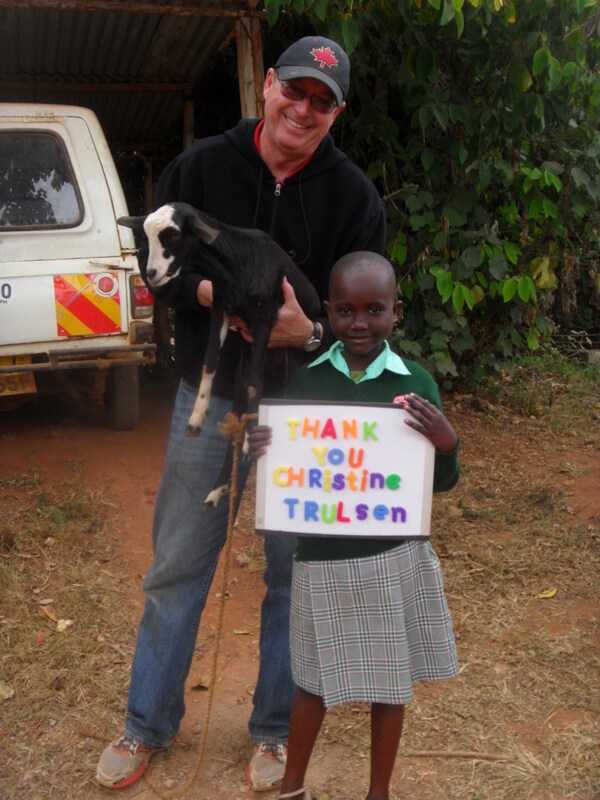 $40.00 provides a goat for an orphan. 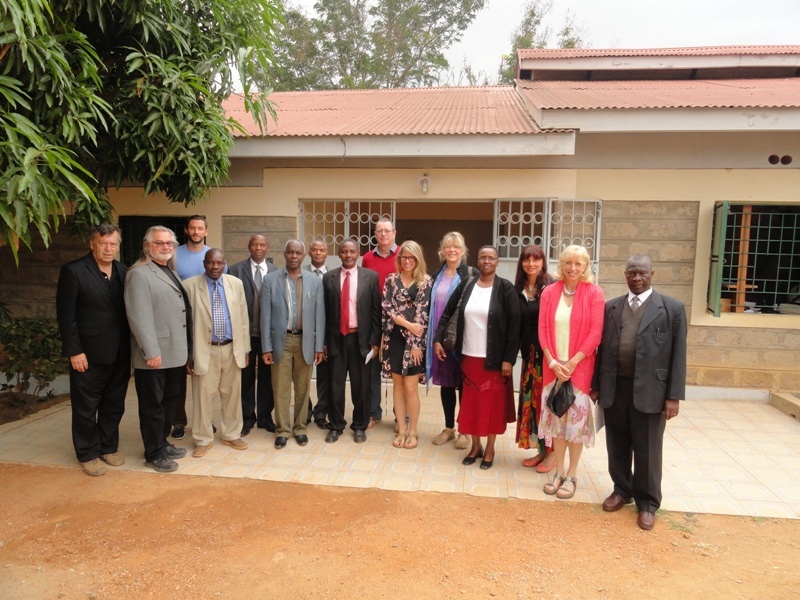 Ruth arranged for our delegation to meet with Governor Kivutha Kibwana of Makuena County, (6th from the left). He is an impressive gentleman who has a history of fighting for democracy and honesty in government. He promised to visit the Children’s Residence and see how his government can help provide for the program and its children. 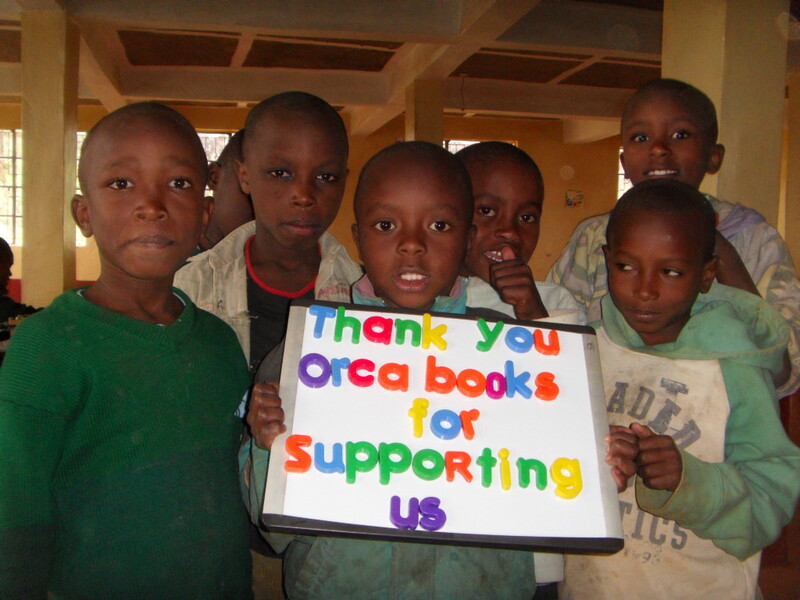 The donations from Chris Turner and Orca Books are being put toward our new vehicle. 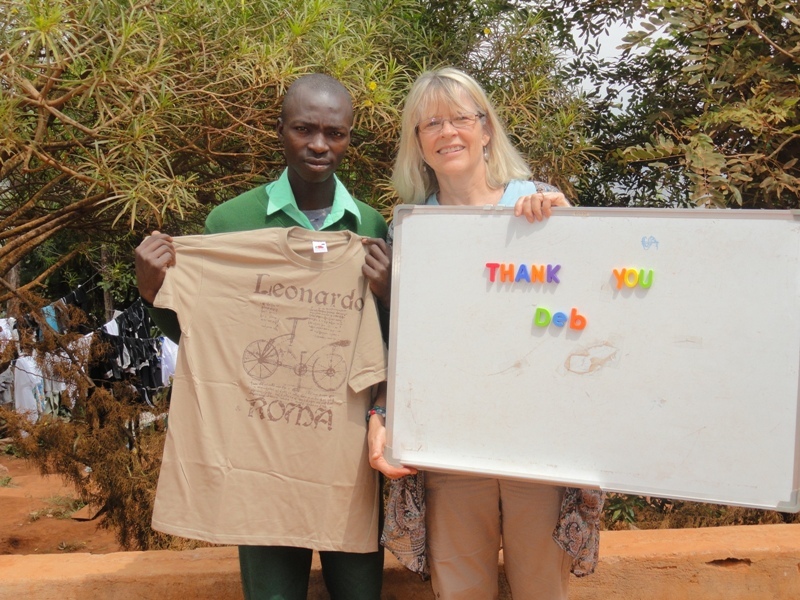 We have been ‘borrowing’ Henry and Ruth’s very, very old car and truck to use on business for the program, including delivering and picking up supplies and livestock, and transporting our children. We have been saving up for a newer vehicle – a gently used 14 seat van. 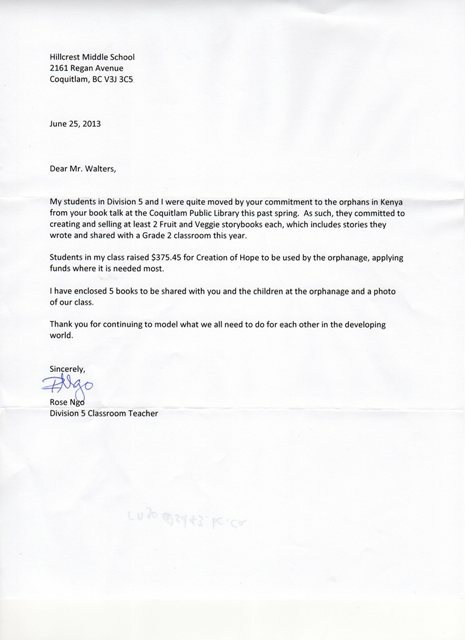 During the summer we made a final request and funds have been donated. In the September update we will list all of the generous donors as well – we hope – unveil the new vehicle! It’s not too late for anybody who wishes to make a donation. Surplus funds raised will go toward a few extras for the building and start our campaign to purchase a piece of land adjacent to the residence that we will be turning into a play area. 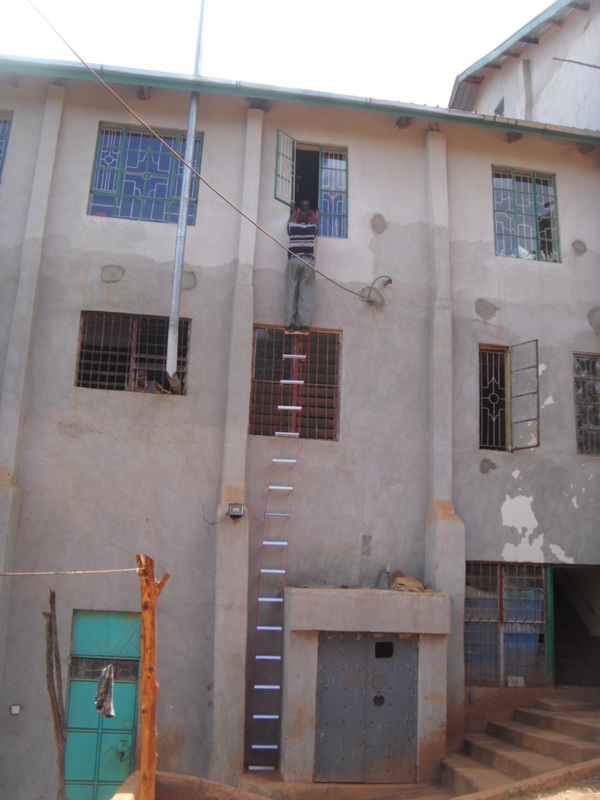 As part of fire safety – an emergency ladder purchased with funds donated by Dean Dempsey. We’re working with the children on issues on fire safety, evacuation, establishing a meeting spot outside the burning, and having government officials coming in to help with the training. 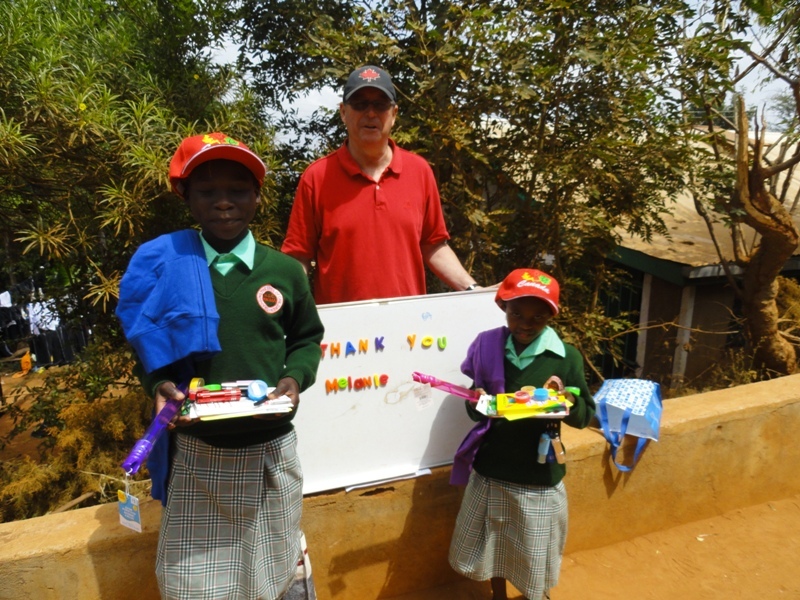 Dean has also offered to pay for fire extinguishers and these are being purchased in Kenya. 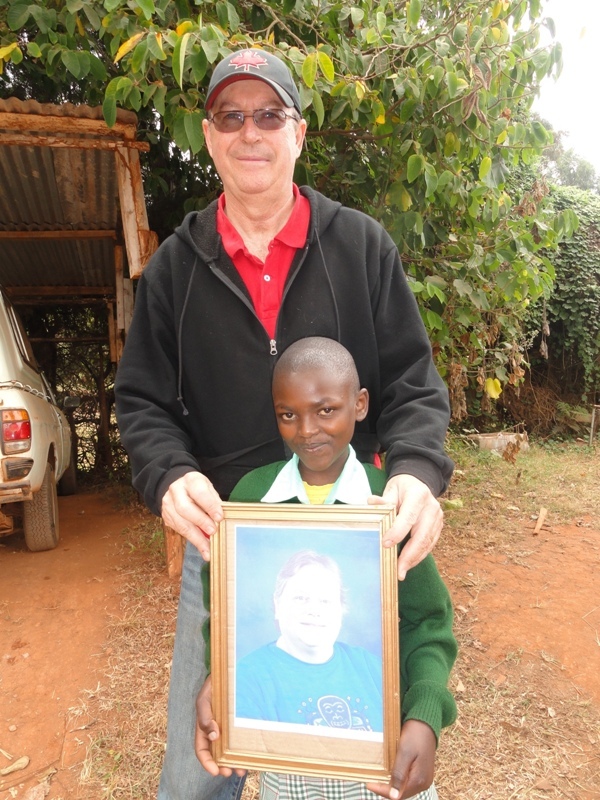 Marc Stevens made another generous donation to be used for his sponsored child Mwendwa David and his family. 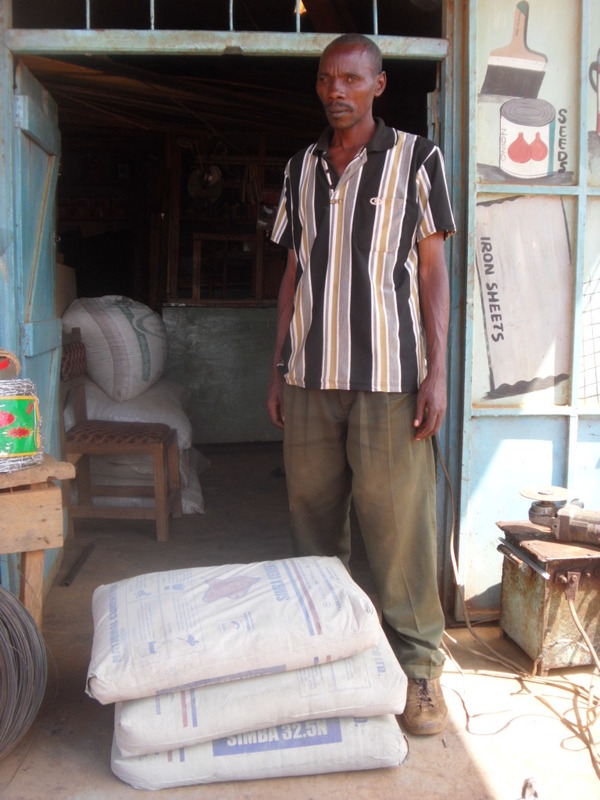 There are pictures of Mwendwa with the the purchases in the September update. 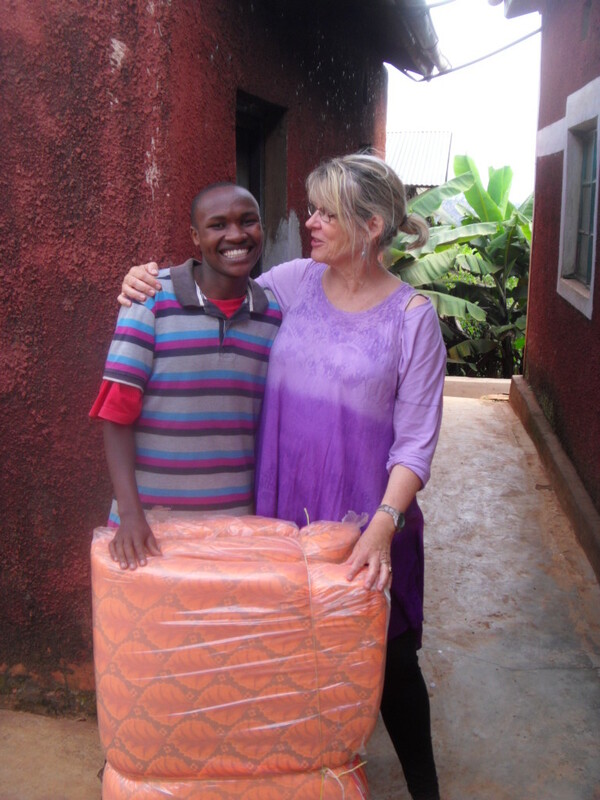 From Mollie for Mutuku – a new mattress and other funds donated to help him through the school year. 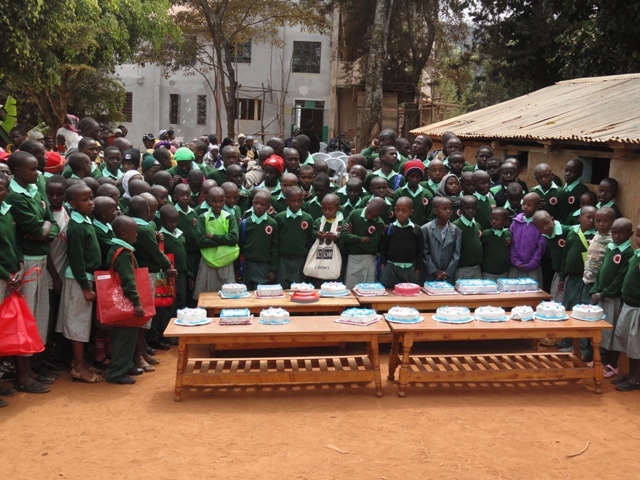 A shared birthday party for Emmanuel (pictured), Baraka and Ndaisi paid for by the sponsors. As always, Melanie generously supports her ‘girls’. 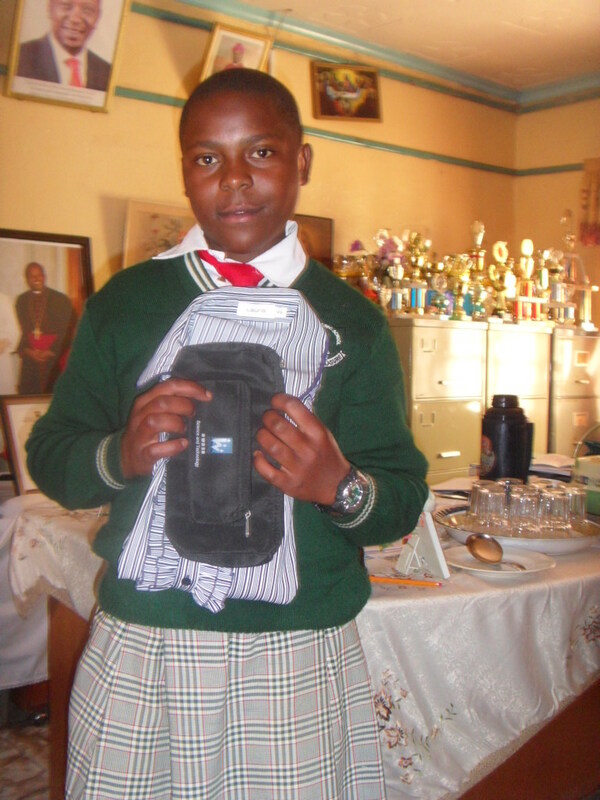 Presents for Ruth from her sponsor Beth, given by Anita at Ruth’s school – a prestigious National School! 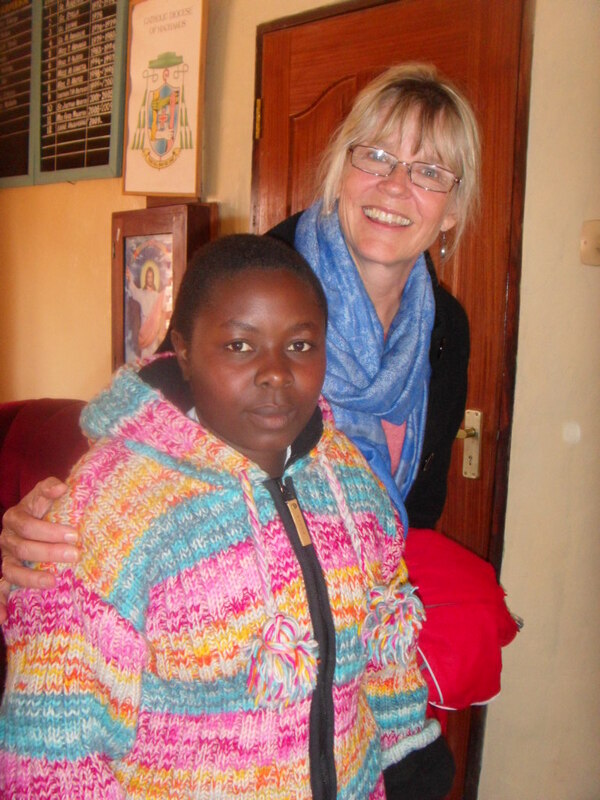 Sarah receiving presents from Lou-Anne her sponsor, posing with Anita. 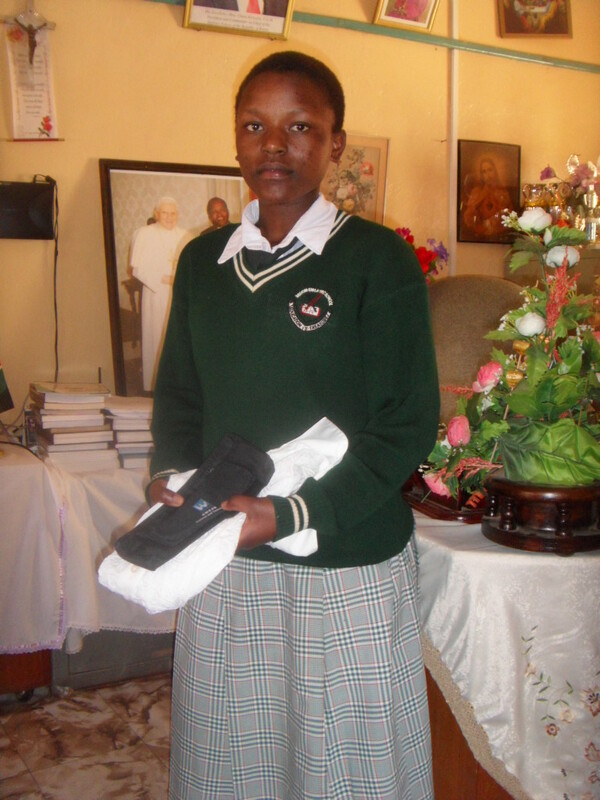 Sarah is our fourth student at the National Level school! 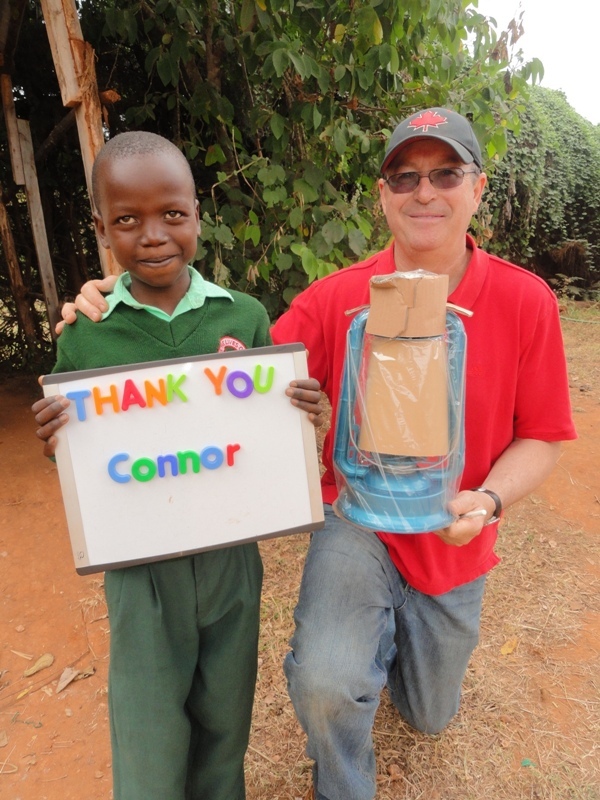 Cement from Connor – sometimes the best presents are more ‘concrete’ or can light up the night. 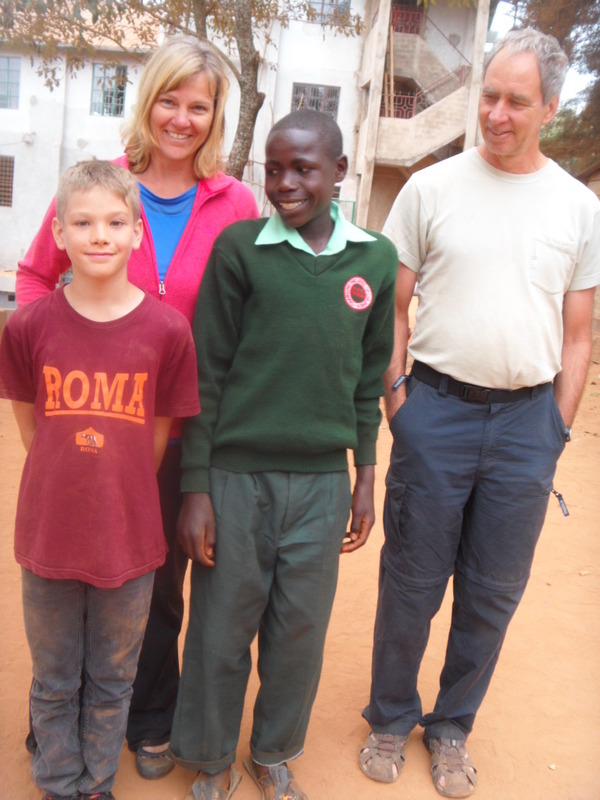 Cliff, Sandi and Keaton meeting their sponsored child Jackson. 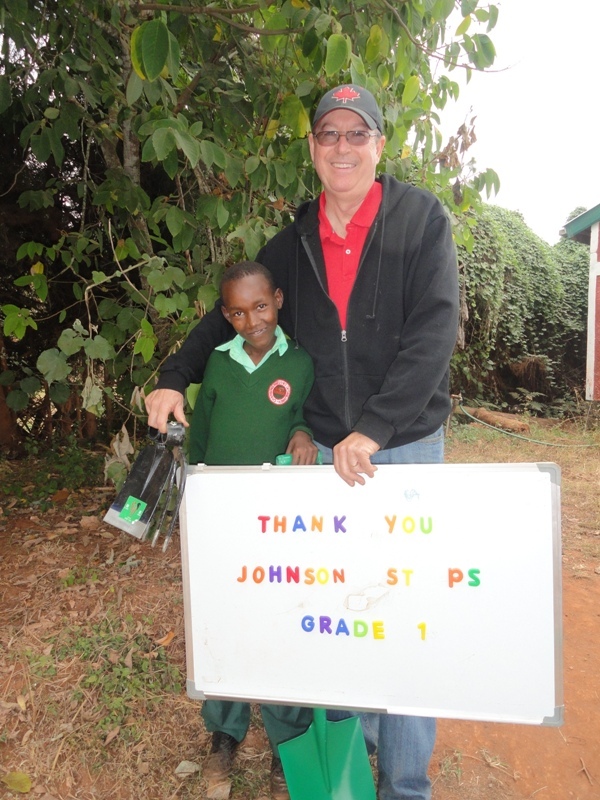 The Hall family traveled throughout Kenya and spent extensive time visiting and volunteering in Kikima, living on the grounds of the Children’s Residence. 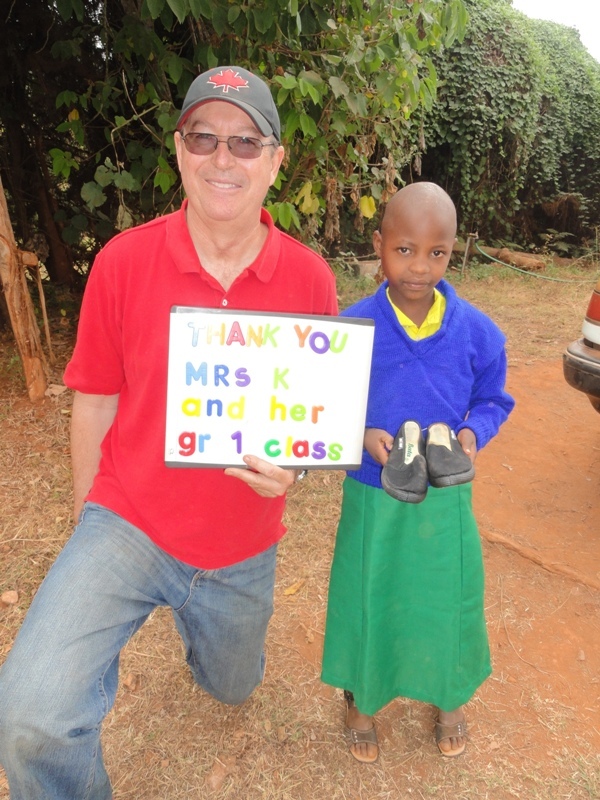 A final picture – children receiving shoes provided by a generous donation. I’m going to ask for ‘forgiveness’ on this one. While we forwarded this picture to the person who made the donation I’ve somehow ‘lost’ the name in creating this update but still wanted to include the picture.